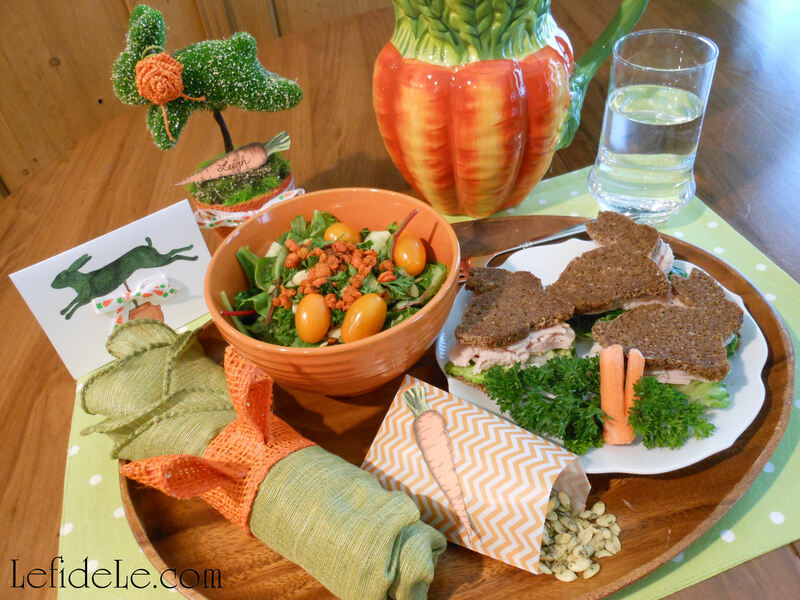 Big bunny mama springs from the center of the table in declaration of a beautiful life. Orange twine wrapped Easter eggs sit on the grass beneath her. Twine and crepe carrots suggest growth of one’s soul. The side table holds another hedgerow spelling Believe. It sits with an additional egg enmeshed in a swirl of vibrant chevrons and burlap lilies. 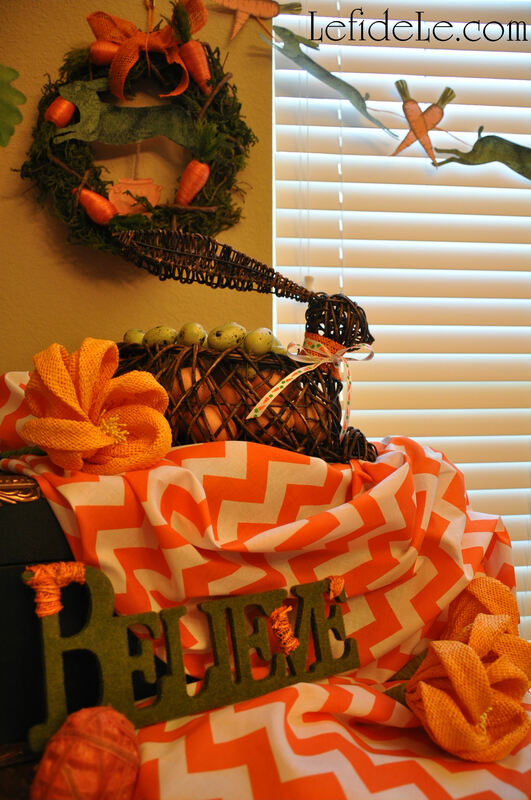 A green trunk elevates another bunny constructed of grapevines holding both faux farm eggs and green bird eggs. 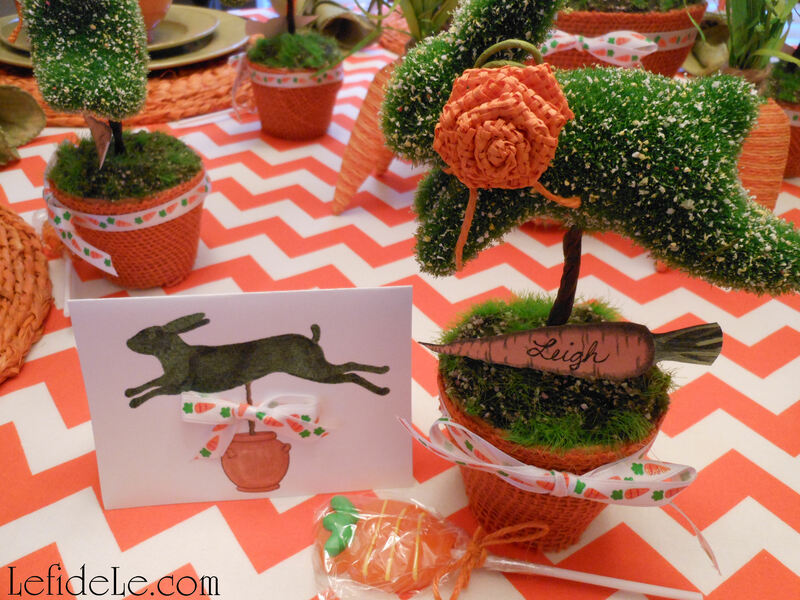 Make your own tabletop garden full of leaping bunnies for your next indoor garden party. 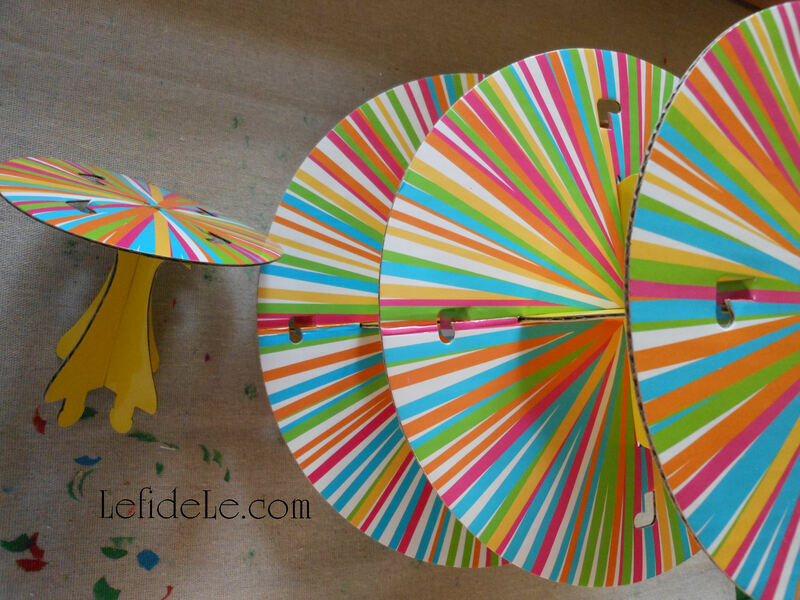 DIY these easy projects 3-dimensionally or with my free printables… or mix and match the crafts as I’ve done here. 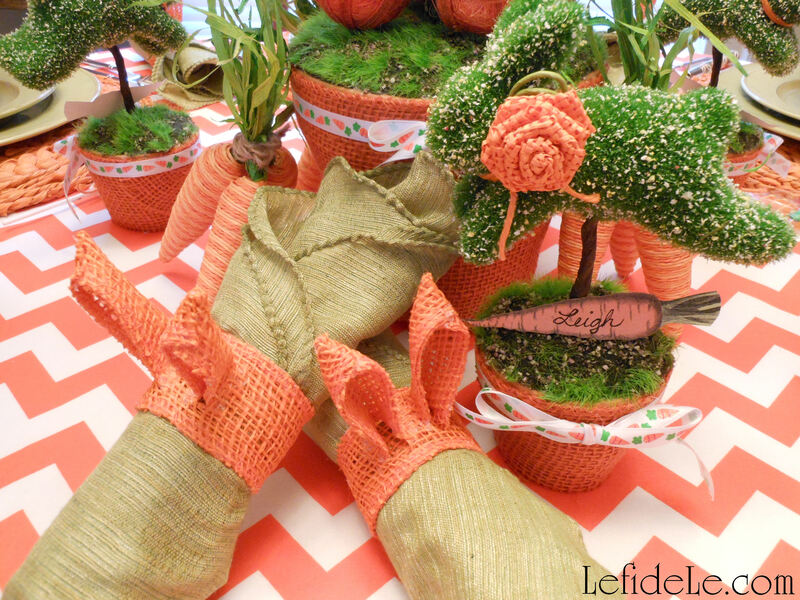 Choose your own color and theme to embellish the bunnies with, or follow my lead and make burlap carrot pots to sprout your menagerie from. 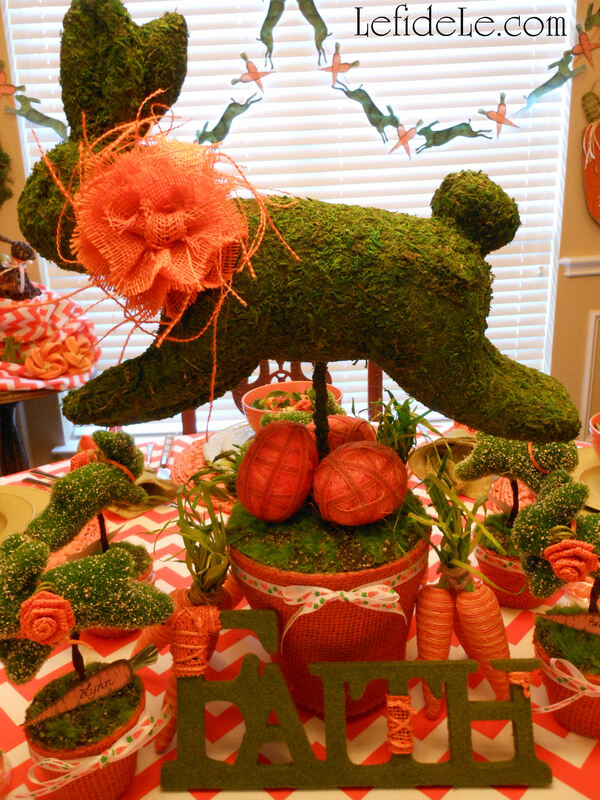 Better yet, keep the wraps, rosettes, and ribbons nonpermanent so the bunnies may be used again for another theme. 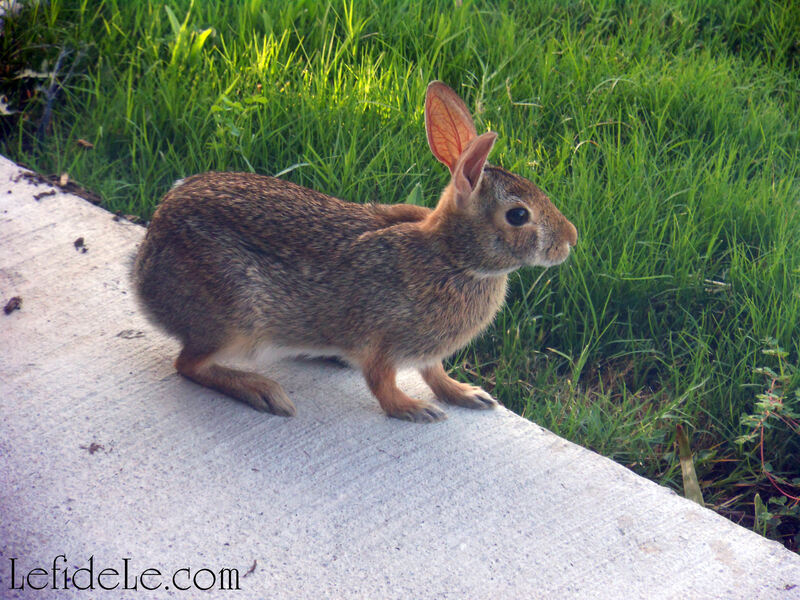 Let these rascally rabbits transform your spring fling into a colossal cute –fest today! 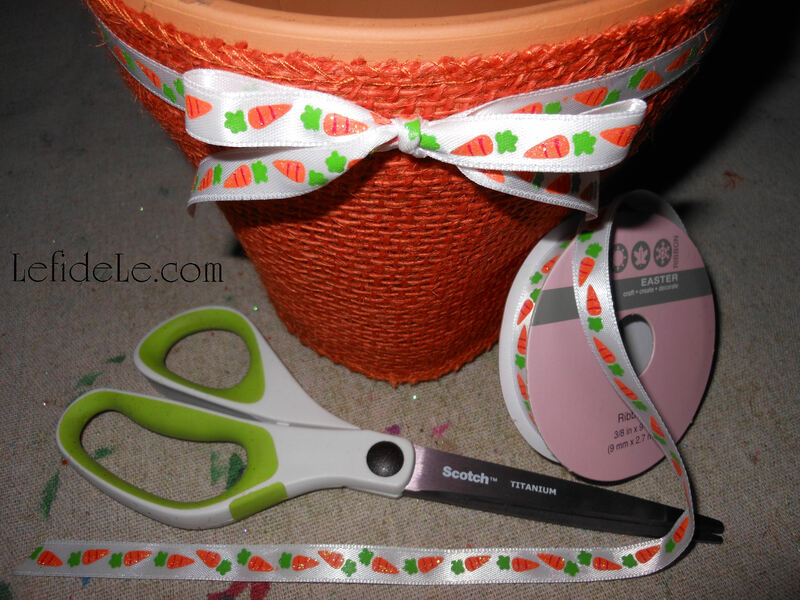 Wrap small terra cotta pots with burlap fabric or ribbon, and cut after the overlap. 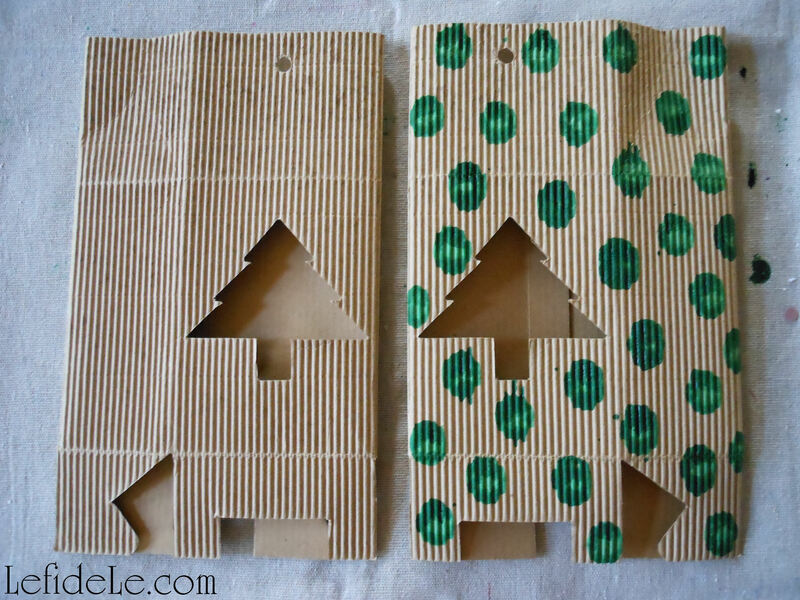 Use dots of hot glue to adhere one side to the other. 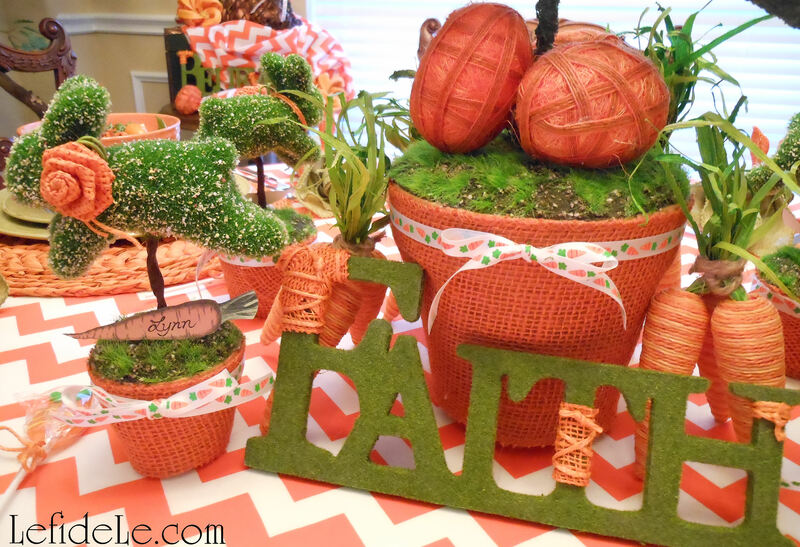 Avoid gluing the burlap to the pot if you’d like to reuse these with another theme, as I’ll be sure to do in the future. 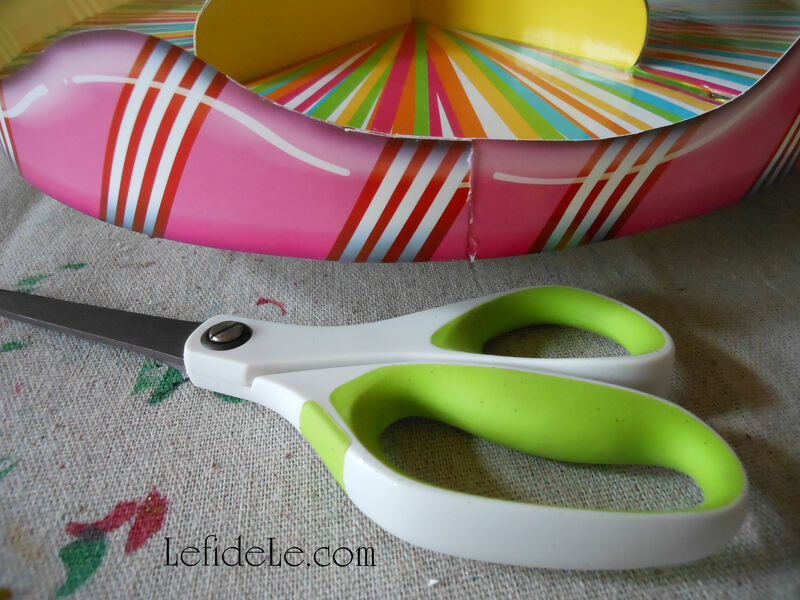 Trim the excess length off with scissors so that the pots sit flat on the table. 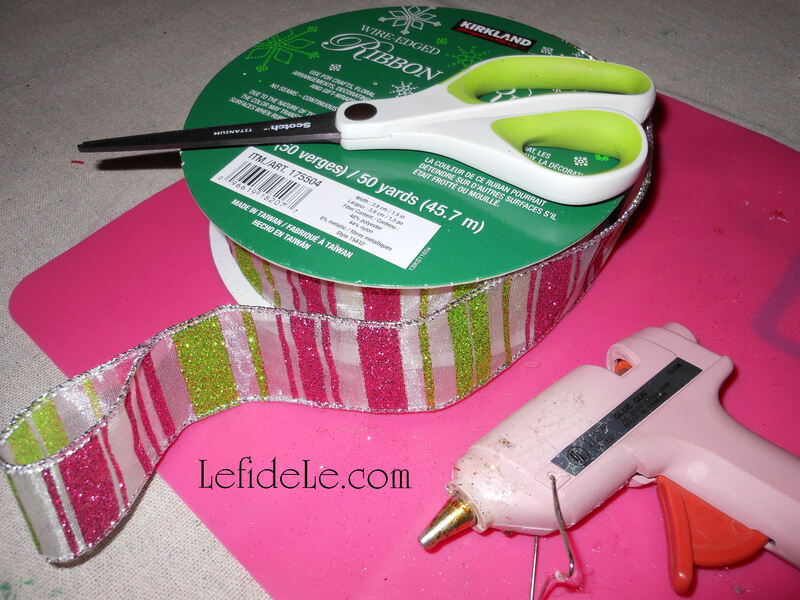 Add a length of ribbon around the top and tie it in a taut bow. 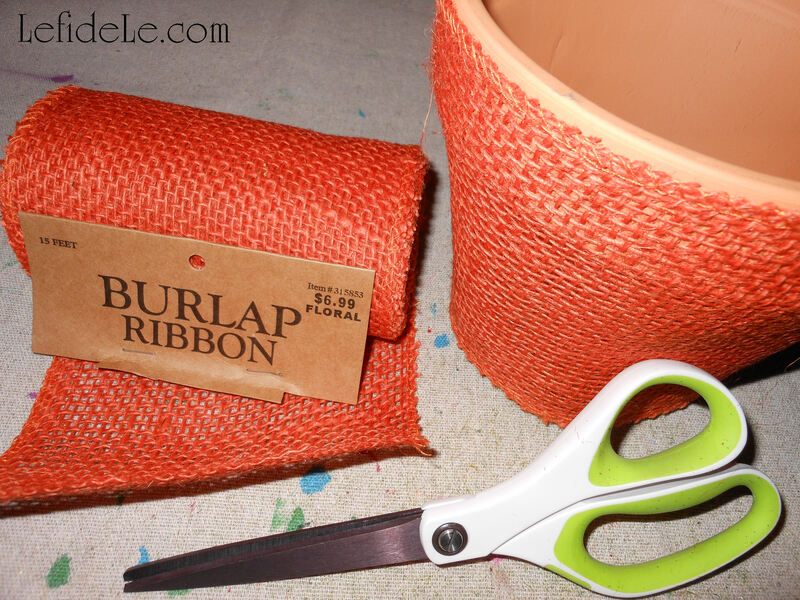 This is not only decorative, but is a trick to keep the burlap securely in place without having to glue it permanently. 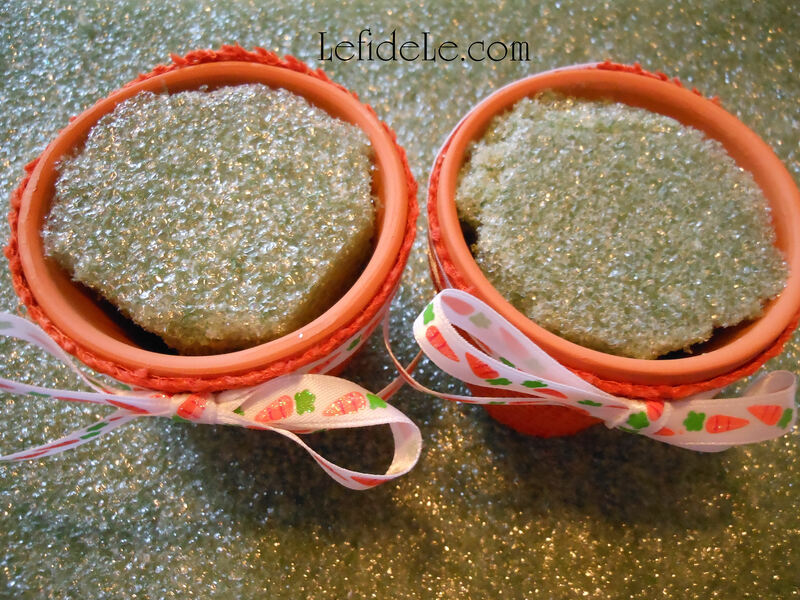 Fill each pot with a chunk cut to fit, from a large block of stryofoam. Wedge little chunks of stryofoam in between the large block and the wall of the pot until the large block has no wiggle room. 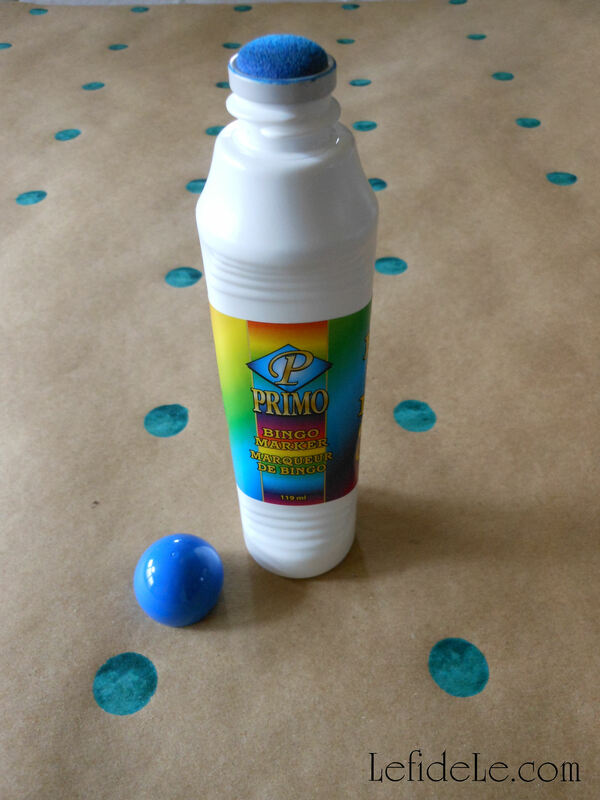 This keeps your creation from drooping later. 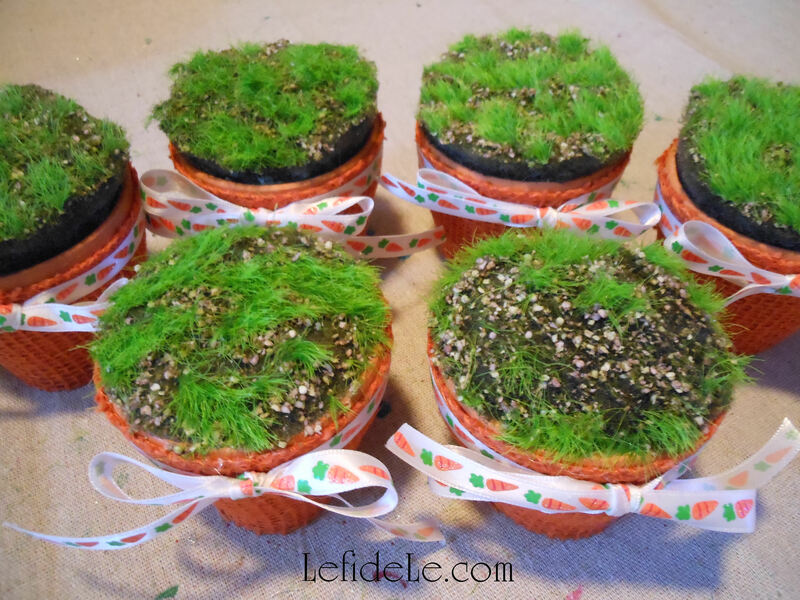 Glue ground cover to the top of your moss. 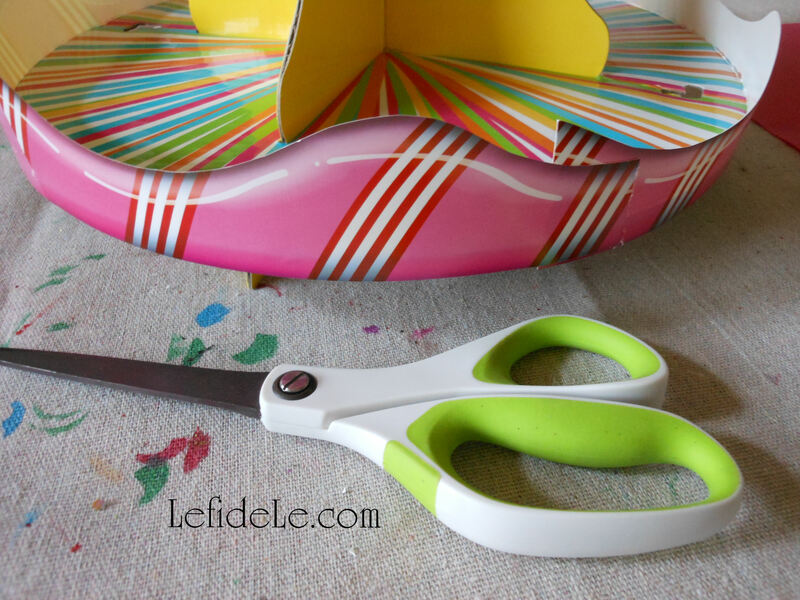 Do this by cutting the green edges to fit the pot, and gluing those edges to the rim. 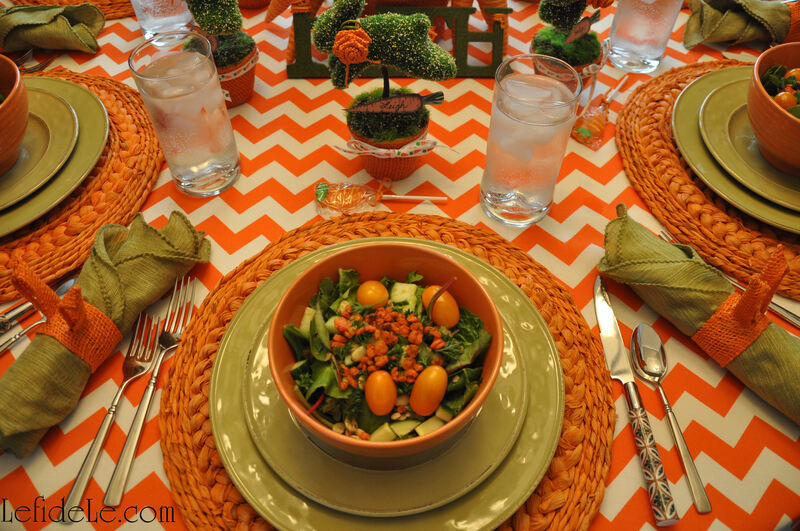 I used faux earth meant for a table runner, but I’ve seen similar stuff in the form of placemats as well. 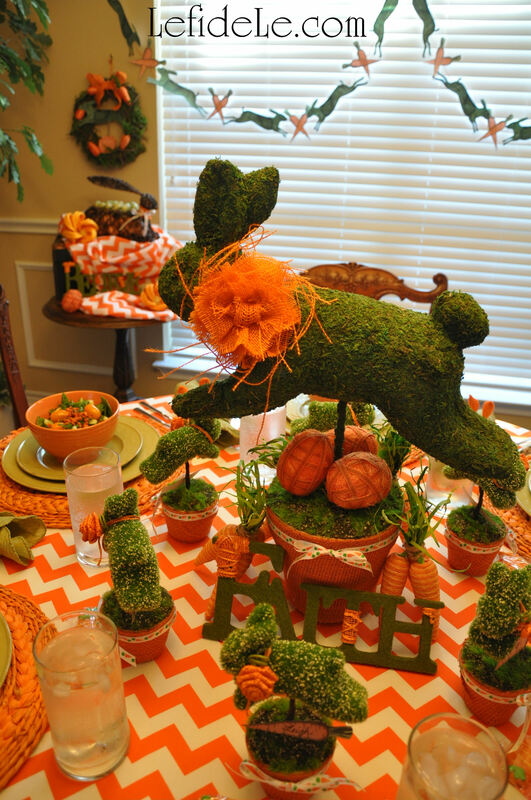 Other options are faux Easter grass, moss ribbon, Astroturf, green burlap, or grass printed scrapbook paper (for the printable topiary). 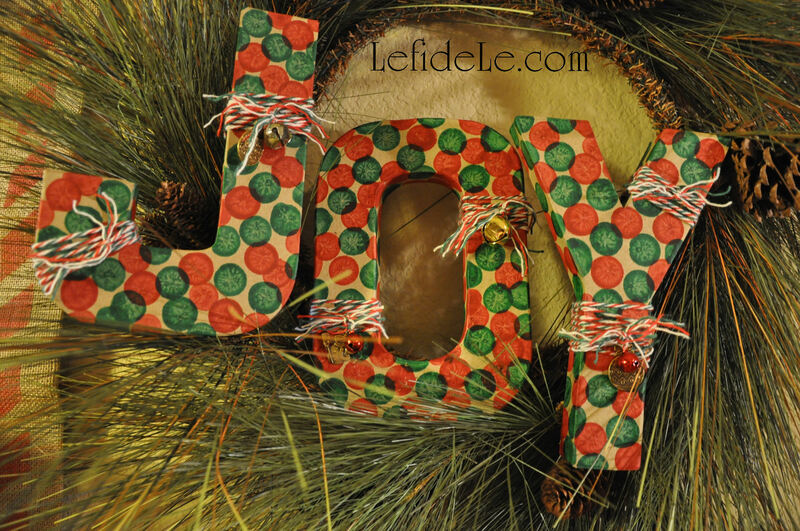 Cut stems, sticks, or dowels to jab into your ornaments, and wrap them with brown floral tape. 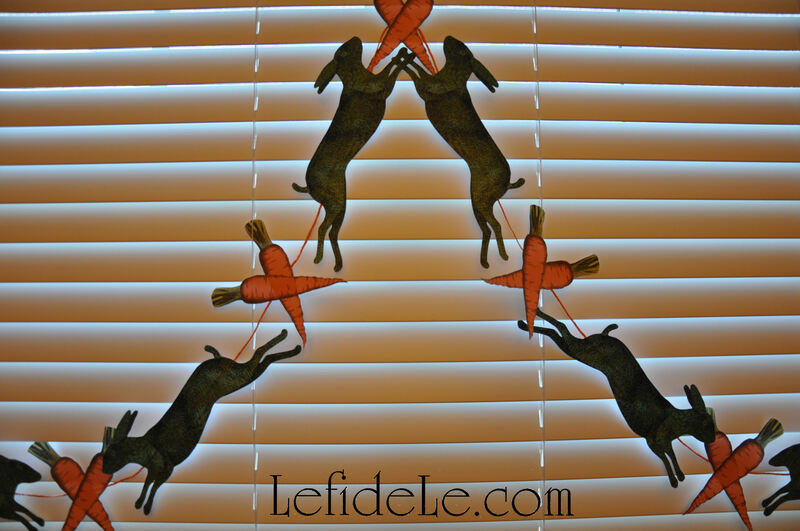 If your animals are already on sticks, simply cut them to size with good sheers. 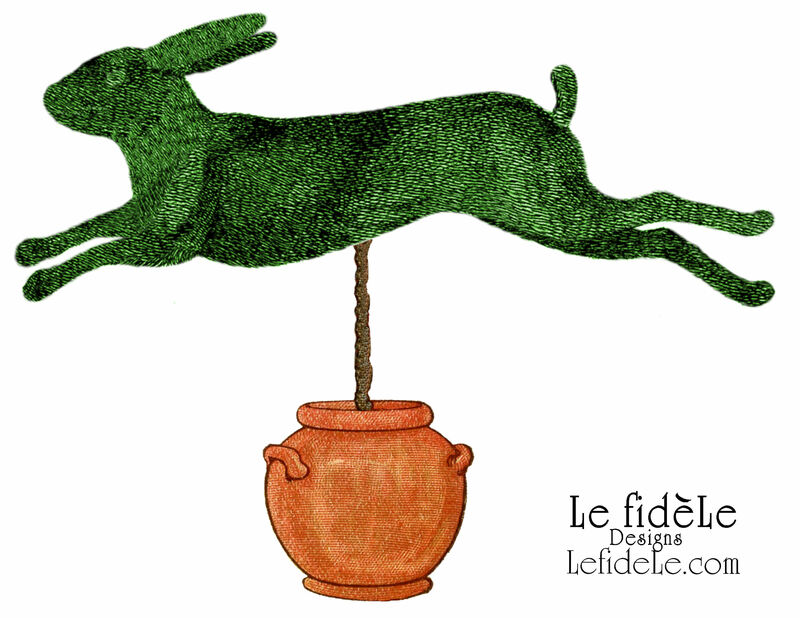 It’s easier to embellish your bunnies before potting them. Double-wrapped a length of jute (or yarn, ribbon, twine) around each bunny neck and knot it loosely. 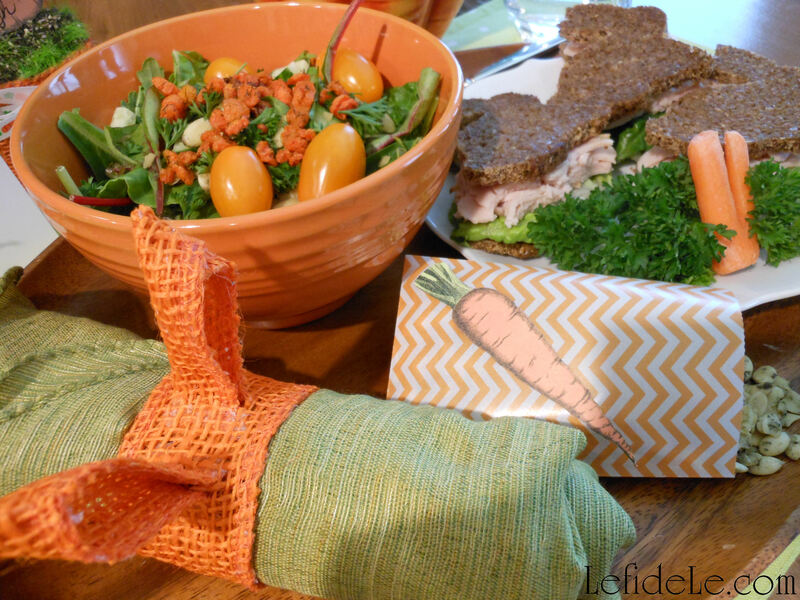 Slip a burlap rosette under the jute so that it sits securely without glue. Make a pilot hole into the center of the green stuff. Do this carefully with any sharp point from an awl to a screwdriver. (I used a scissor side… but I have a tendency toward crafting dangerously.) Lastly, jab the bunny stick into the pilot hole. 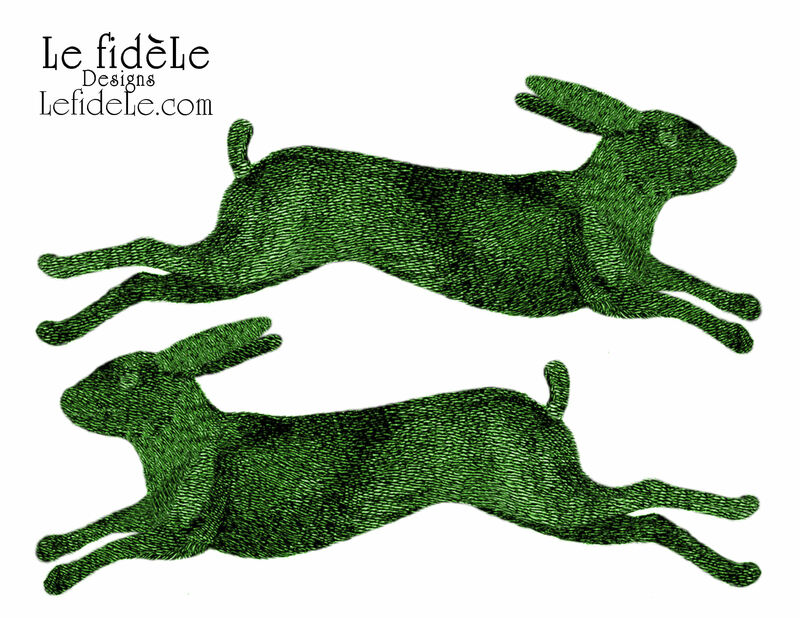 Continue crafting the rest of your rascally rabbits. 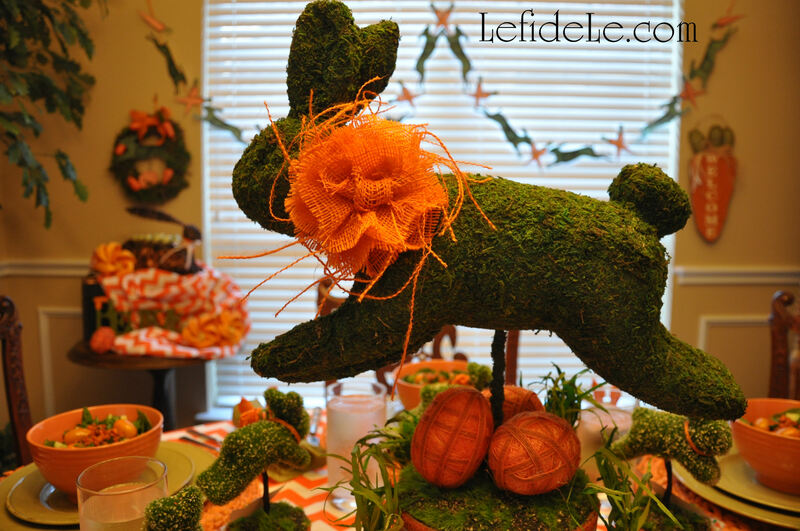 Another option is cover a carved styrofoam shape with moss, as I have done with the larger bunny centerpiece. I’m not going to cover that in detail here because it took a lot more time, energy, and patience. If you choose to go that route, you can either purchase a ready-made animal shape, or carve one from a block of stryofoam yourself. Foam cutting knives are available that will make the job slightly easier. One way to add foliage is to cover your creation with moss ribbon as I have done. This is a kind of moss covered carpet tape. Cut it into pieces and round the edges, so that the animal shape may be completed in an unseen patchwork. Adhere the patches with hot glue, pressing firmly. 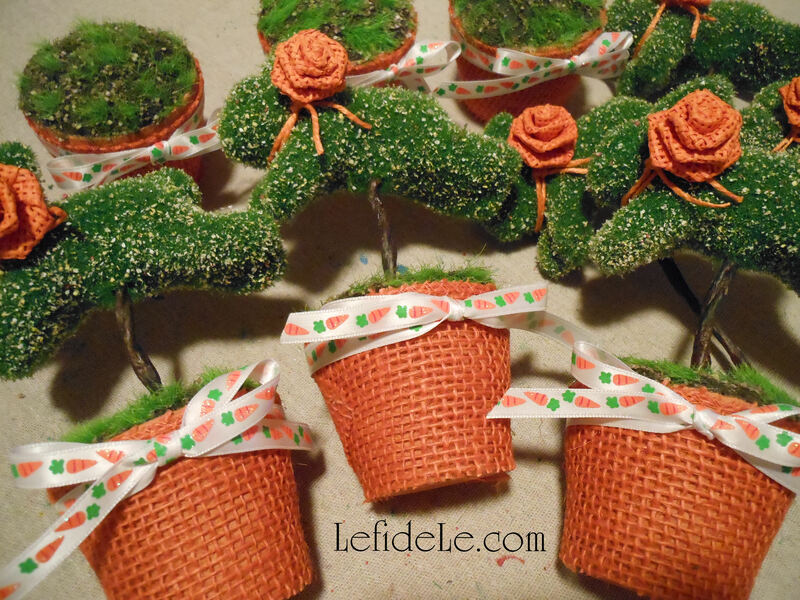 Embellish it with a burlap ribbon collar and flower, and pot it in the same way as I showed you earlier. 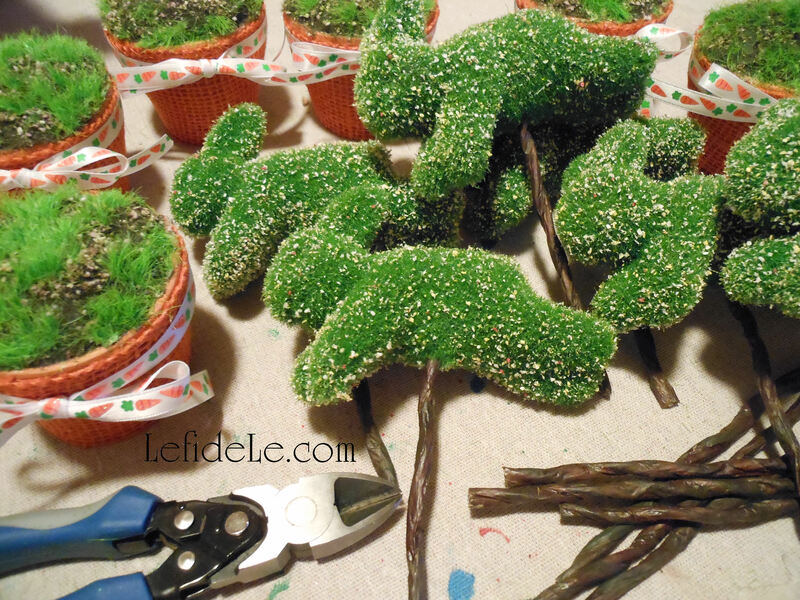 I wanted to reuse the bunny topiary again for future themes, so I did not glue the collar to the bunny. I simply glued the flower to one end of a length of ribbon, and then wrapped the ribbon around the neck. I began with the blank end and looped it underneath. The weight of the flower resting on top of the opposite ribbon end kept it firmly in place. It will look completely different with a another color of base wrap and type of collar embellishment. 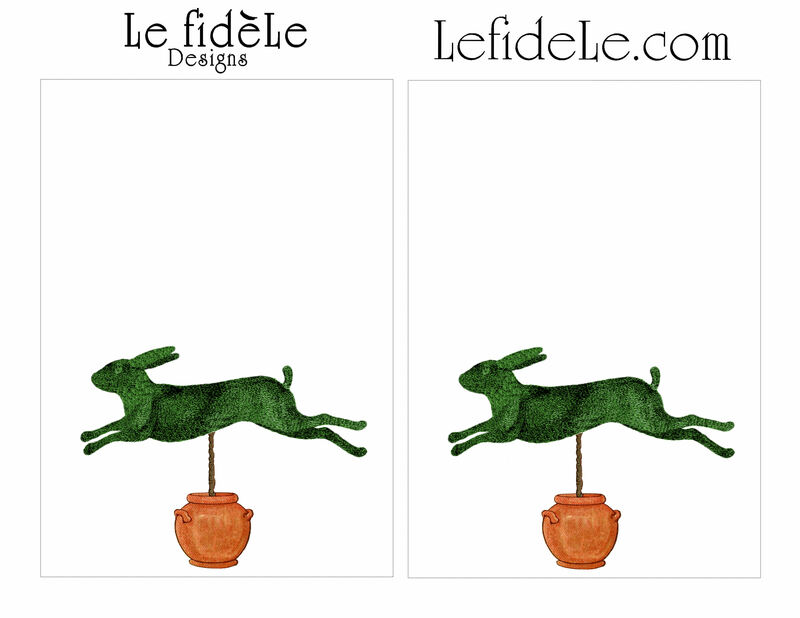 The following are my leaping bunny printables (free for noncommercial use). Right click on the image you want to use, and select print. Choose color and photo settings for your printer, and print them on sturdy white cardstock. 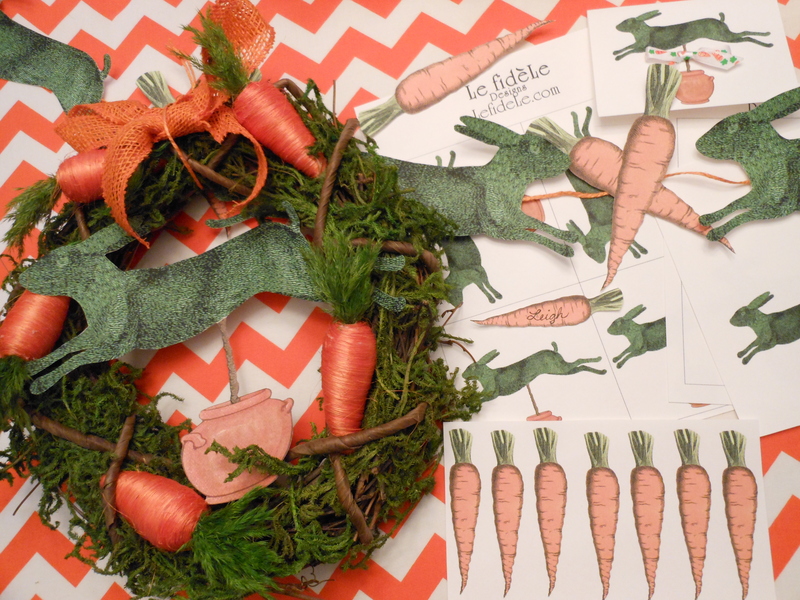 To make a paper topiary from my printables, begin by printing and cutting out the two opposite facing bunnies. Glue them together, back to back with a stick or popsicle stick in between. Pot the stick, as shown previously, and embellish it further with paper rosettes and ribbons. 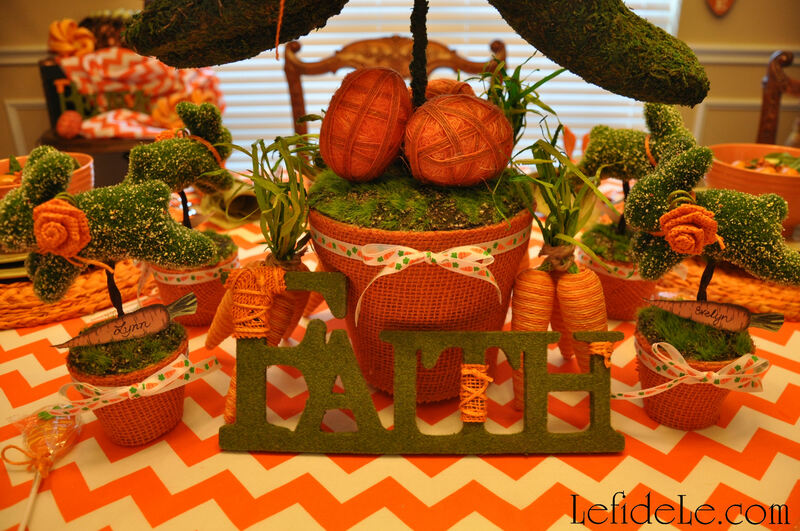 Cut out the carrots to use as place-cards that rest on your newly crafted topiaries. 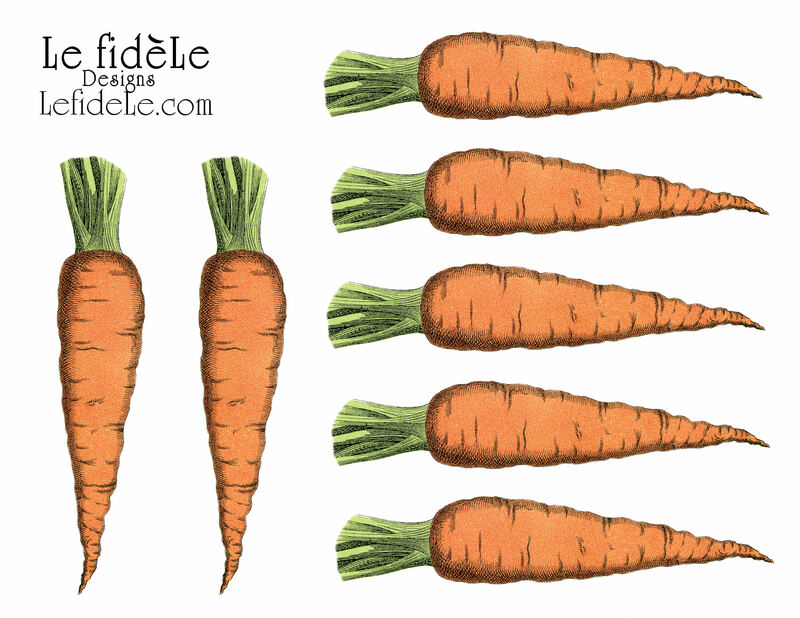 I printed mine, 2 sheets to a piece of cardstock, so that they would be smaller than the banner carrots. Another option for folded place-cards, is to print out the 5×7 invitations / thank you cards and fold them in half. 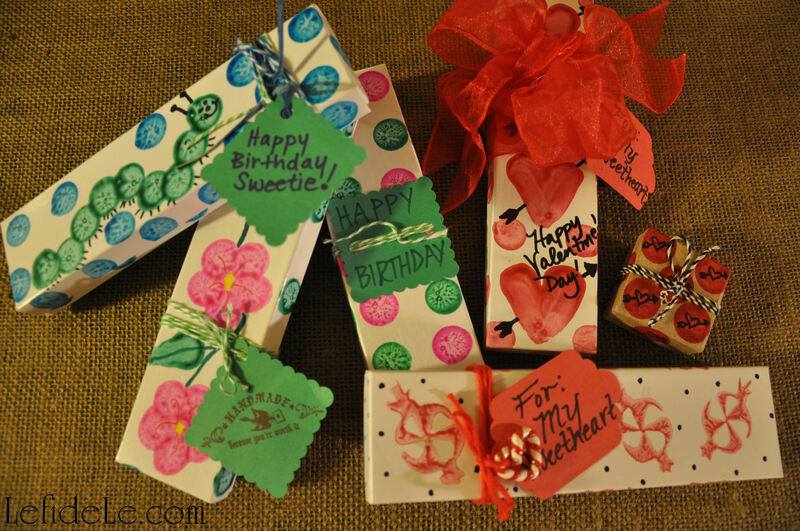 Embellish them with tiny bows or paper flowers, and write guests’ names on them. 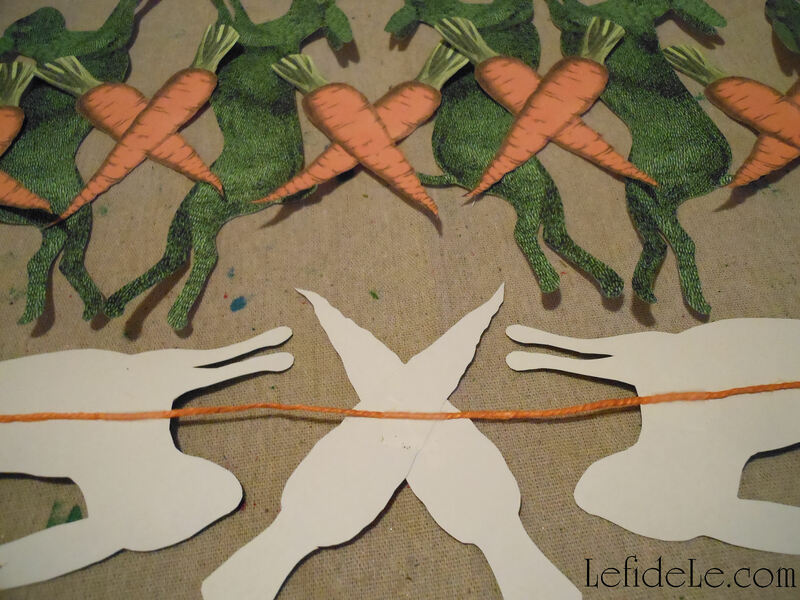 Make a banner with the bunnies and carrots by simply arranging them in a pleasing manner and taping the backs to jute, ribbon, twine, or yarn. 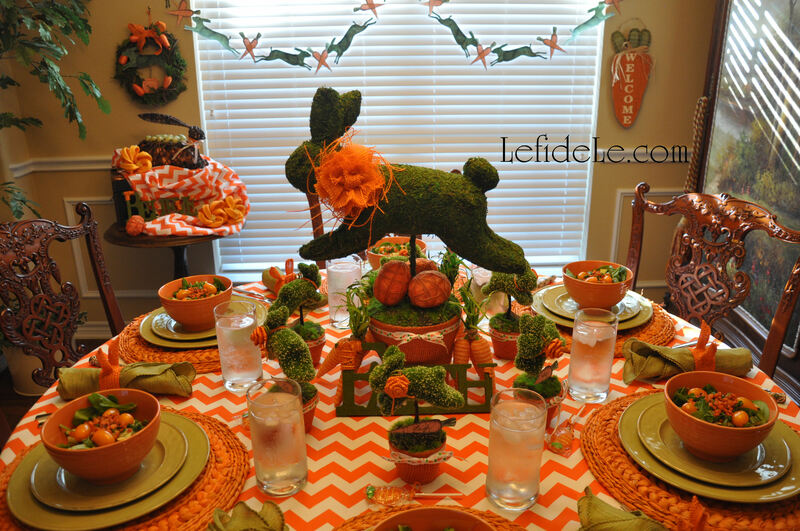 I chose to criss-cross the carrots between the bunnies. A loop at each end makes it easy to hang with clear thumbtacks. 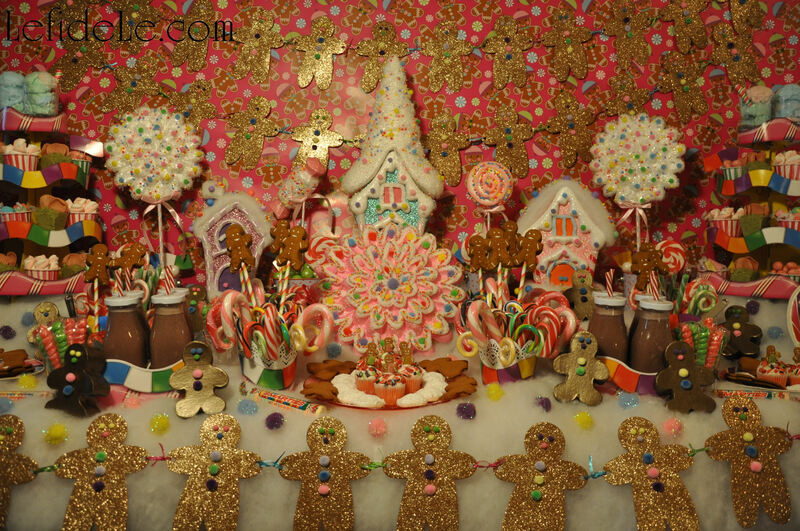 A Candyland village of (glittered) gingerbread houses sits nestled atop an icing laden hillside (of buffalo snow batting) dotted with (pom-pom) sprinkles. 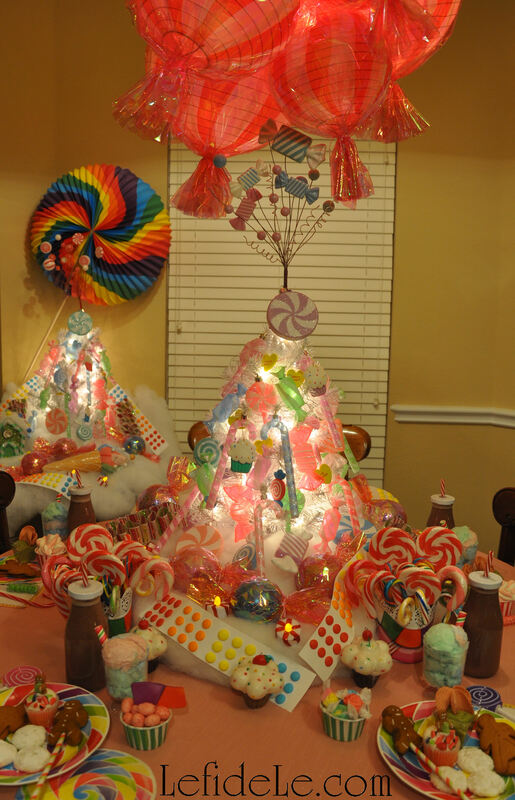 (Faux) lollipop trees spring forth from gumball forest floors (in speckled metal pails) and (real) candy-cane thickets abound. 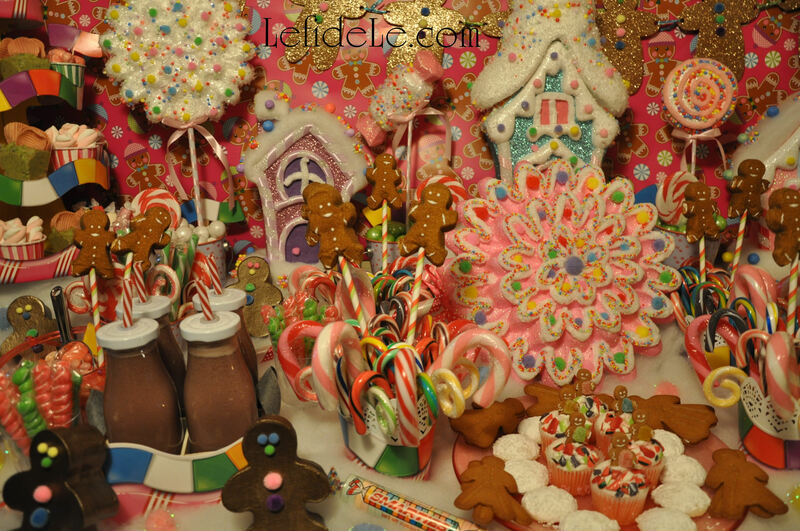 Gingerbread people (treat boxes) populate the village, travelling amongst the wellsprings of jellybean pools (in pink plastic pails). A few “gingies” guard a fenced supply of the village’s juice-milk stores. 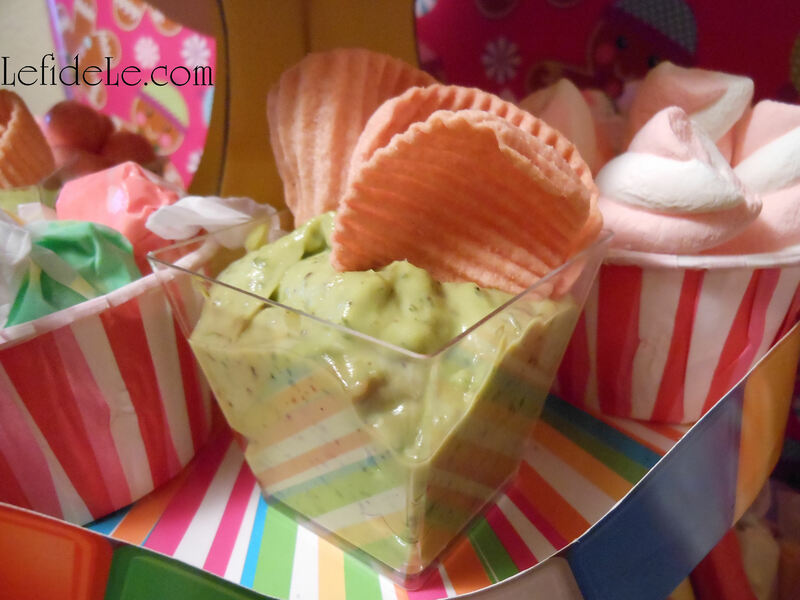 Gingerbread (banner) clouds float high amid skyscraping treat towers holding abundant soirees offering peppermint candied almonds, twisty marshmallows, pastel taffy, and (healthy) spicy guacamole shooters with pink pomegranate potato chips. 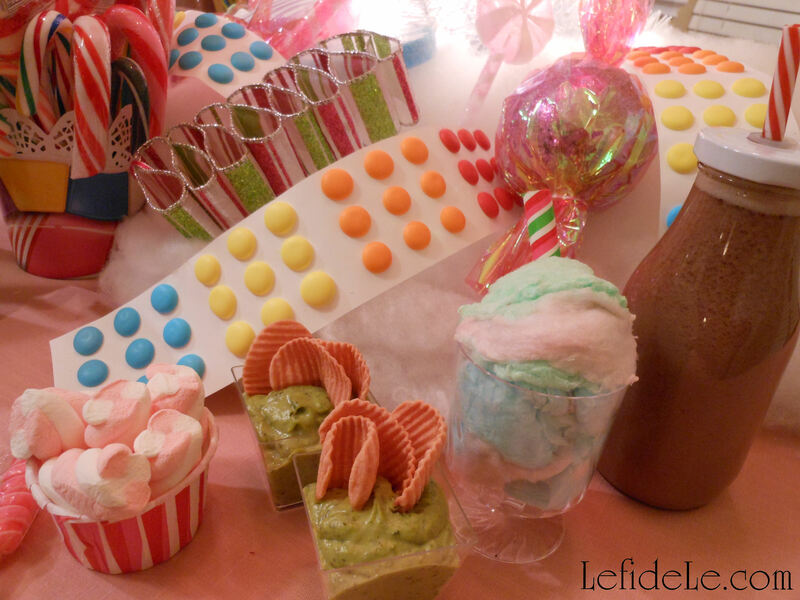 The towers’ penthouse floors encircle trios of cotton candy “cream” sodas with peppermint striped straws. 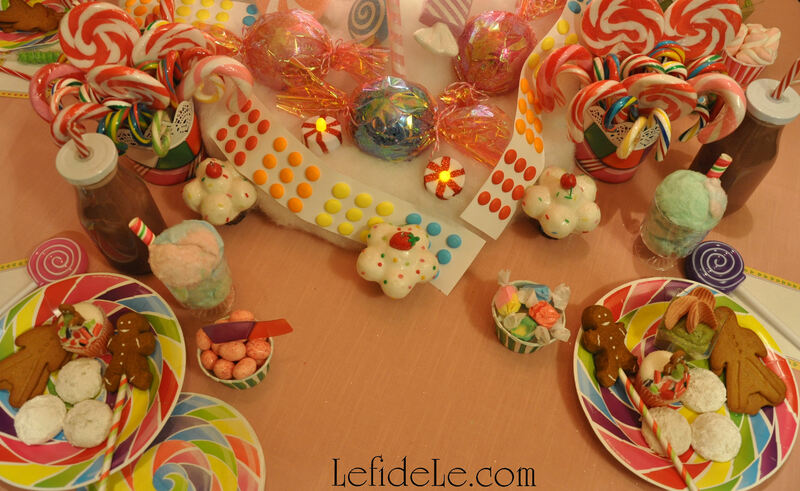 Round rainbow swirled plates and napkins stand by to serve Candyland visitors. Boxed and wrapped candies sit ready for shipment to their final destinations. 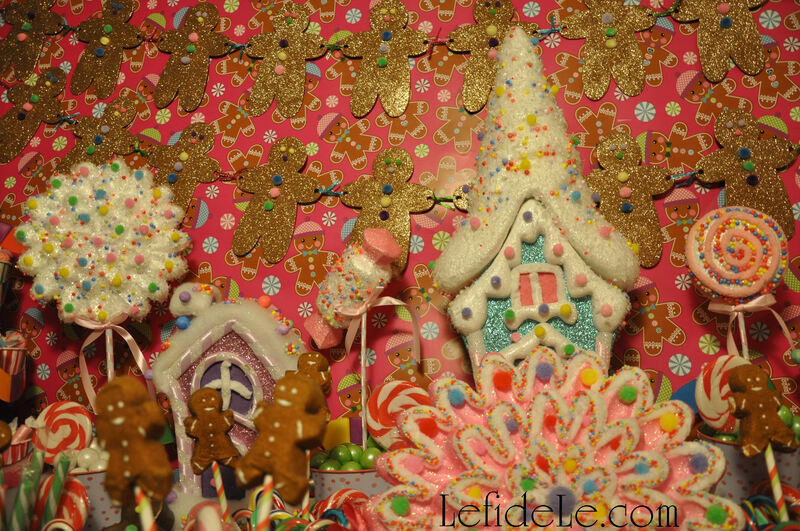 Gingerbread peep billboards pop up to signal the way to gastronomical paradise. 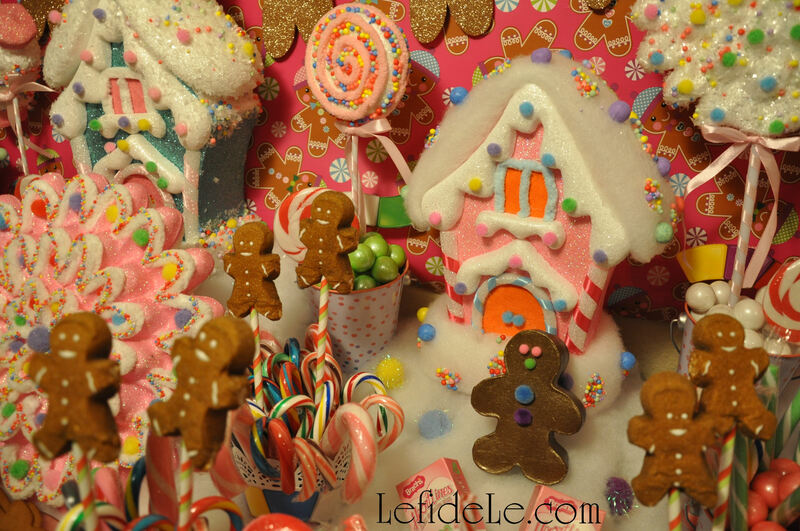 Gingerbread (cookie) ladies and gentlemen hold snowball (cookie) fights in the village round, whist the tiniest of “gingie” tots toddle home with gumball treats over candy-cane cobblestones lain over pink velvet (cupcake) roads. 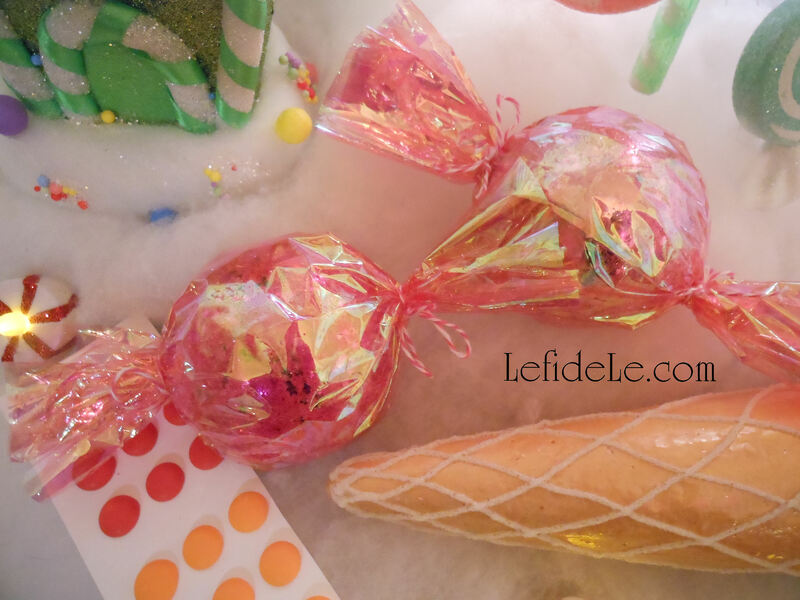 A low gingerbread fog sinks below the sugary iced hills perched above a pink (cloth) cliffside. 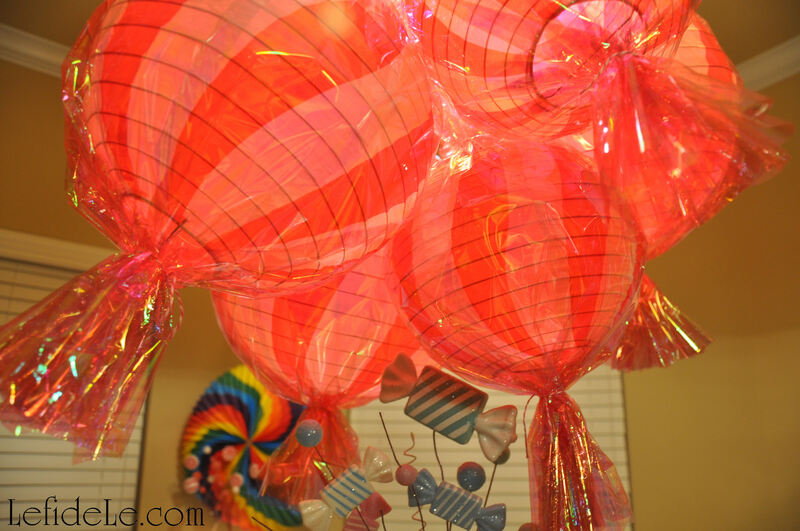 Around the bend, pink hard candy (lanterns) shine high above big rock candy mountains. 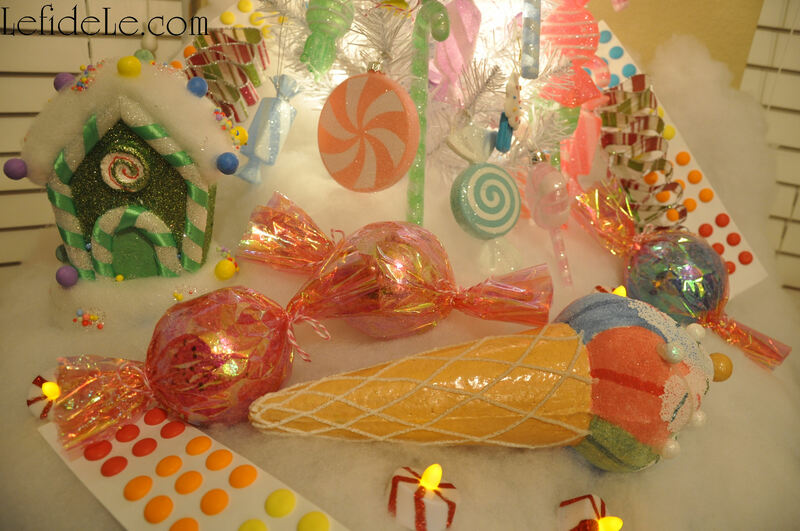 Glowing with hard candy (ornaments), they burst forth with pyroclastic explosions of candy treats spilling over pillowy white icing. 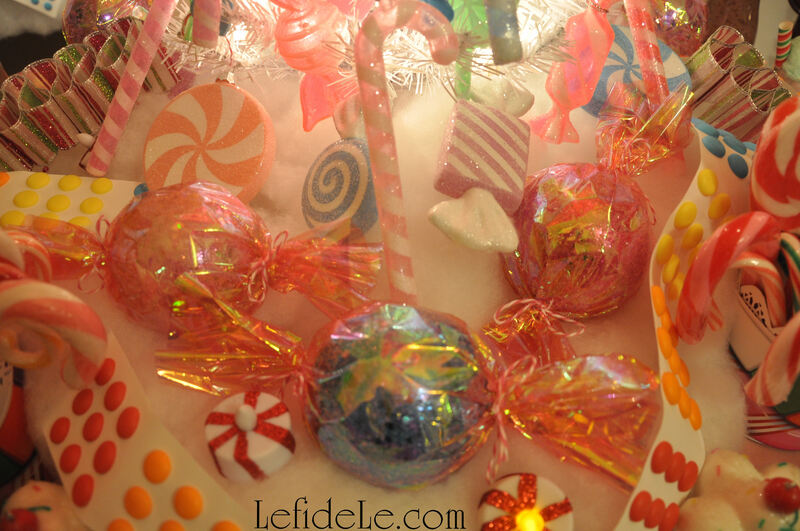 Hard candy (ornament) boulders tumble amid (faux) ribbon candy bushes and flowing streams of (real mega) candy buttons. (LED) peppermint light posts illuminate the scene. 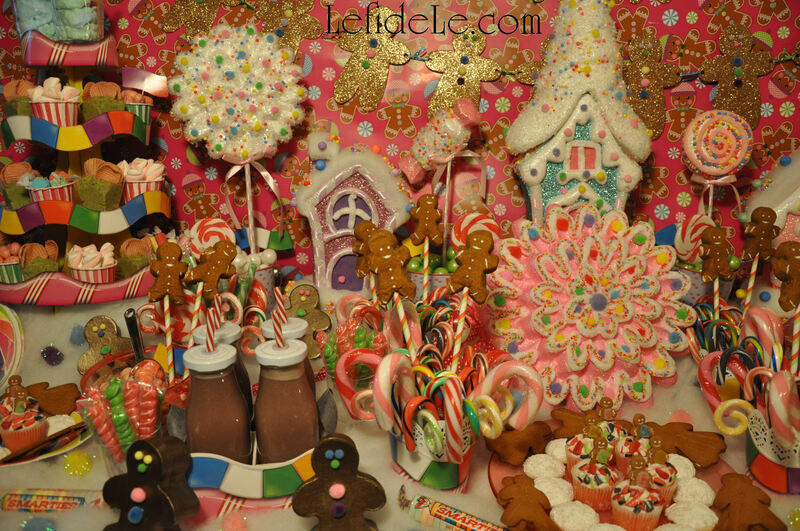 (Real) candy-cane thickets and (faux) cupcake bushes dot the camping site where gingerbread residents roast marshmallows in the midst of the pink (tablecloth) countryside. A rainbow lollipop (lantern) arcs above the distant rock candy mountain (tree). A lone home defiantly stands amidst the candy (ornament) strewn mountainside adjacent to a fallen (faux) ice cream cone log. Wishing you a sweet life of seized moments in eating desserts first! 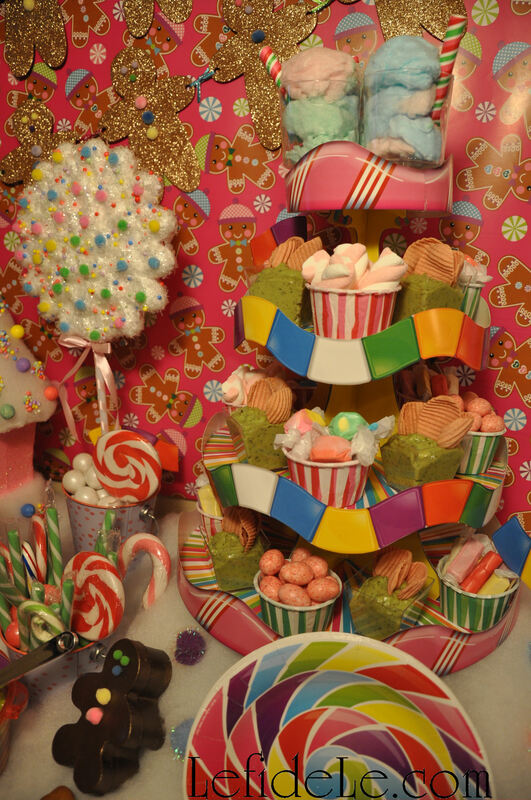 Craft your way to classic Candyland cuteness befitting birthdays, baby showers, and Christmas décor. 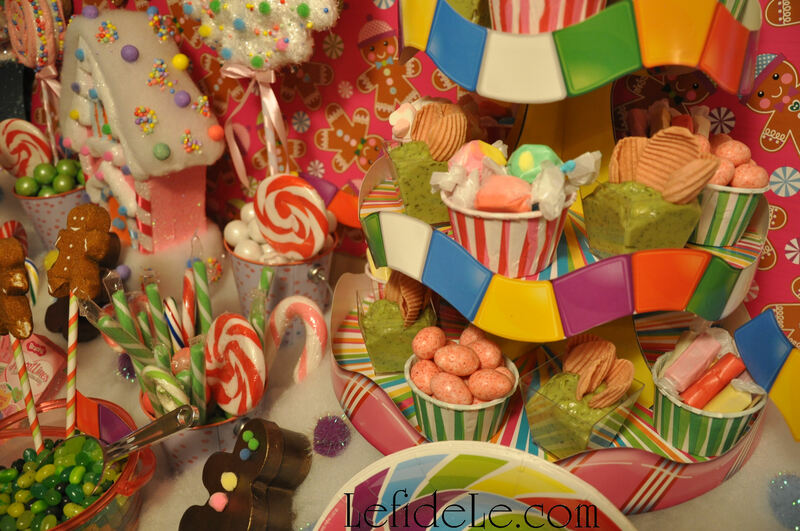 This tutorial for a game board treat tower and easy buffet display are part three of a DIY party decorating series with easy projects and free printables. 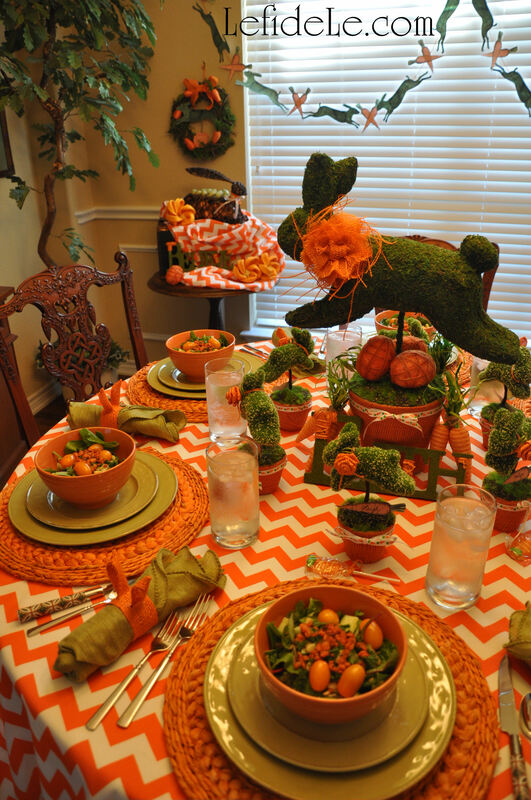 Using some or all of the ideas, you’ll be sure to delight the inner-child in all of your guests. Sweet! 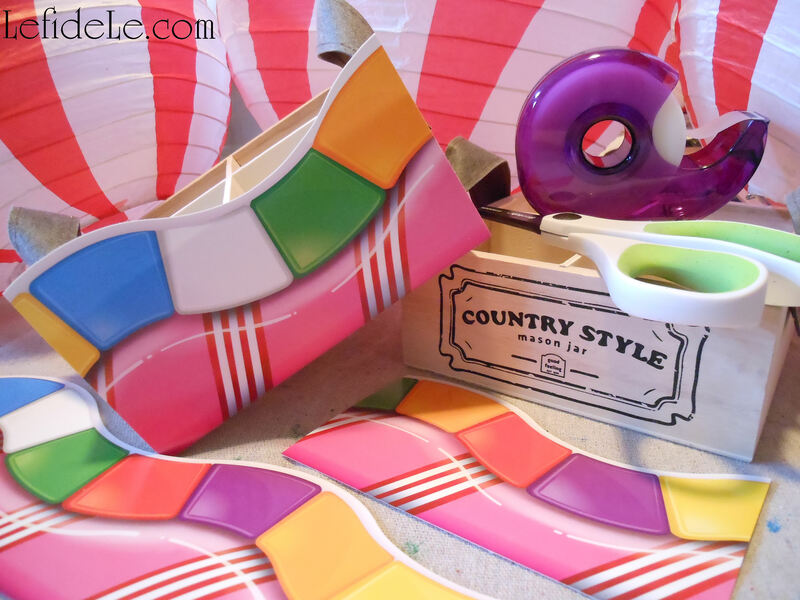 These simple crafts all utilize the same teacher’s bulletin board banner strips in a licensed Candyland board-game pattern. I made two towers, wrapped six pots, covered two milk corrals and a bunch of food picks… and I still have many strips left over! All of this is from one package of super-cute and inexpensive banners that could not fit my theme more perfectly. 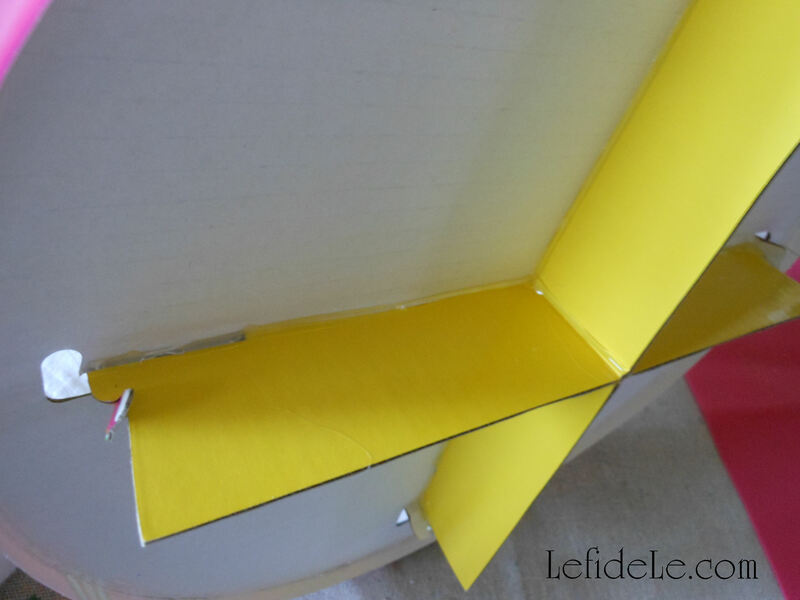 To cover food crates, all you need to do is measure the front width and cut a length off. Double a piece of tape onto itself to hold the cardstock in place during the party. Remove it to reuse later for another craft. One idea is to let the kiddos make thank you cards out of it. 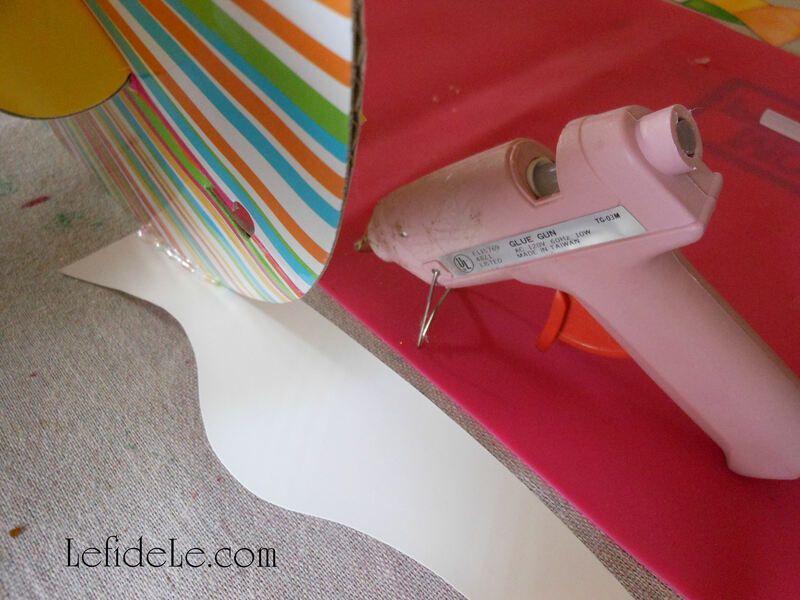 Wrap a length of the banner to coordinate a plain metal bucket to your theme. 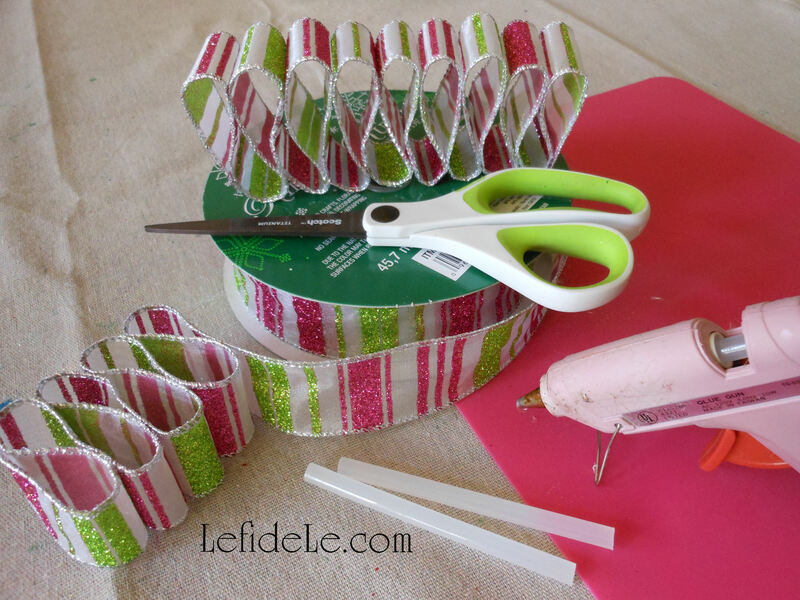 Simply cut and tape the ends together. These can be used to hold candy and prop up Gingerbread Peep Pops (see the Candyland Confections article here). 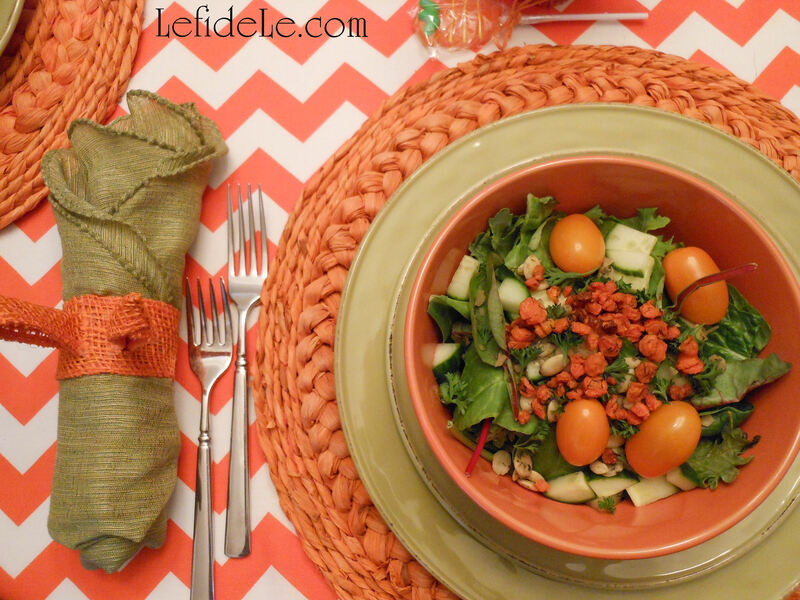 Make food picks by simply cutting the leftover banner end bits into colored squares. Tape toothpicks or popsicle sticks behind them. These can also be used for place-cards if you like. 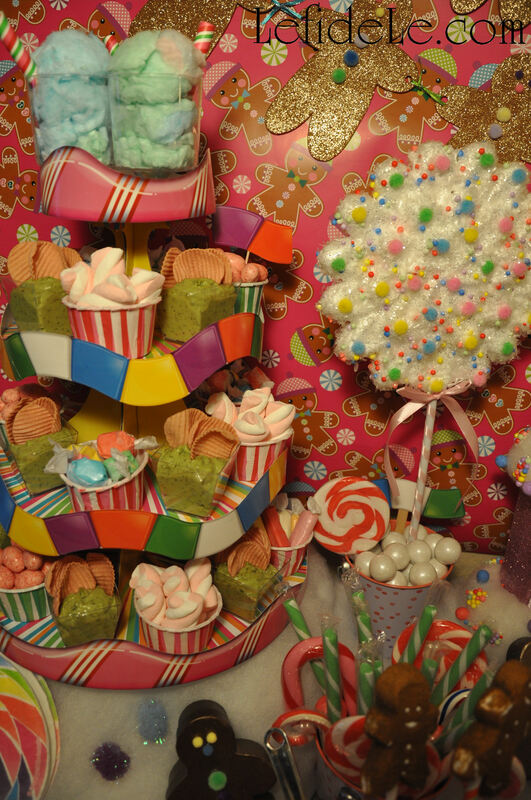 My treat towers begin with ordinary cupcake stands that are transformed into darling 3-D gaming creations. 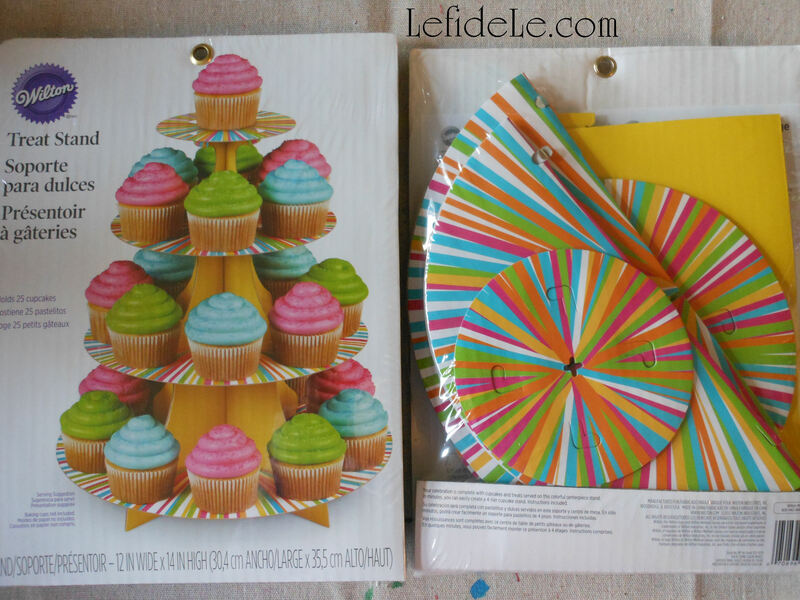 To make your own, first find a commercially packaged stand in a matching color palette. Cut the teacher’s border into two sections (so that they’re small enough to allow food to be placed once it’s completed). I just followed the natural curve of the game path pattern. Put the stand together as per the package instructions. Hot glue the underside if you really want it to be super-sturdy. Hot glue a strip to the outside rim of each level. Cut off the excess length. If your ends don’t match up perfectly, just trim off the top edge to make them appear seamlessly adjoined. 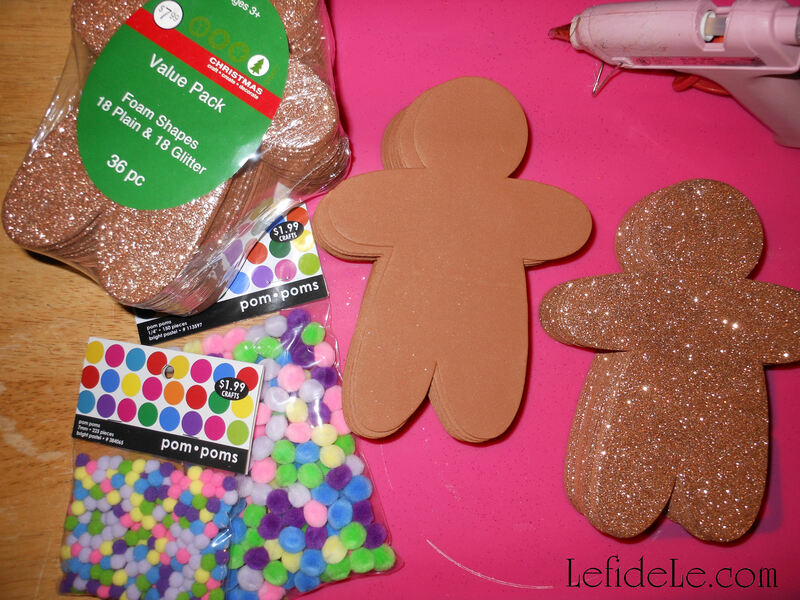 Check out the rest of my Candyland craft series: Gingerbread People Banner, Treat Gift Boxes, & Printables and Hard Candy Lanterns, Candy Ornaments, & Conversation Heart Garland as well as the final party post on Candyland Themed Party Décor Ideas. 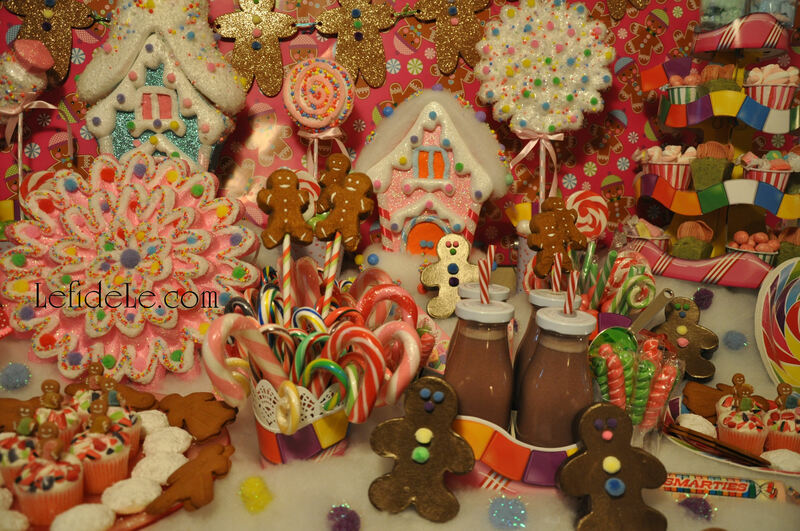 Craft your way to classic Candyland cuteness befitting birthdays, baby showers, and Christmas décor. 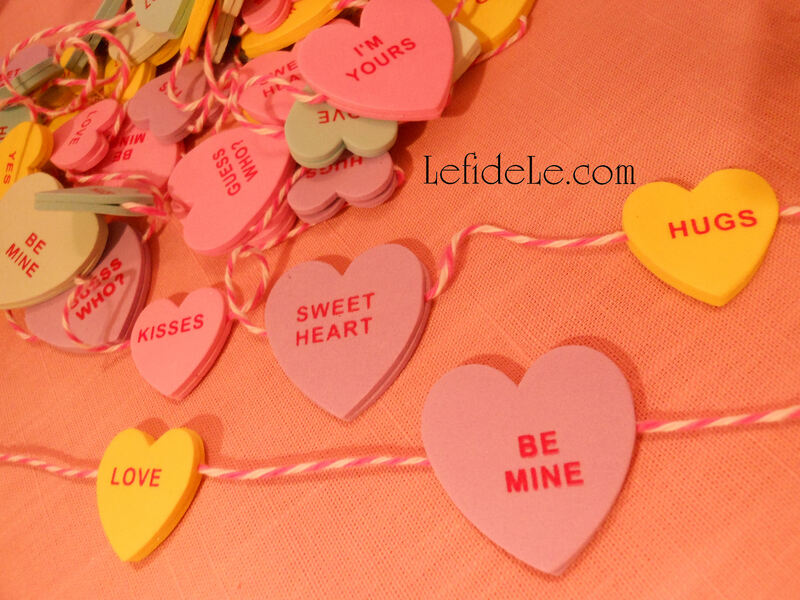 This tutorial for hard candy lanterns, candy ornaments, and conversation heart garlands are part two of a DIY party decorating series with easy projects and free printables. 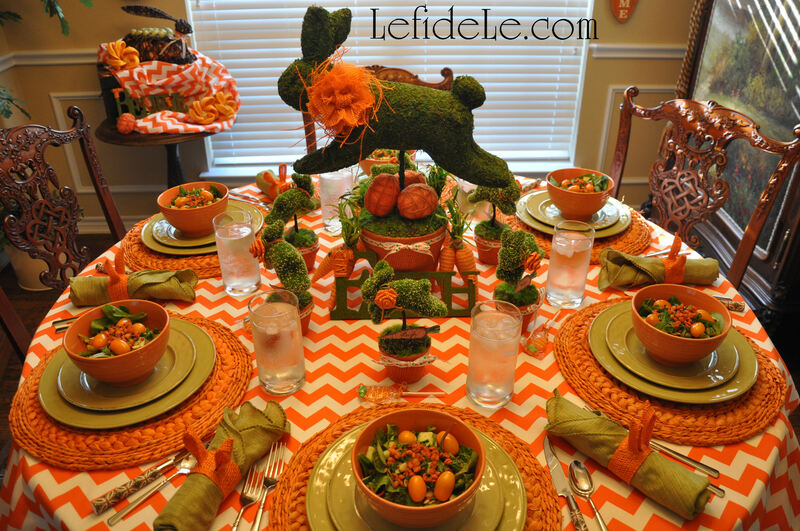 Using some or all of the ideas, you’ll be sure to delight the inner-child in all of your guests. Sweet! 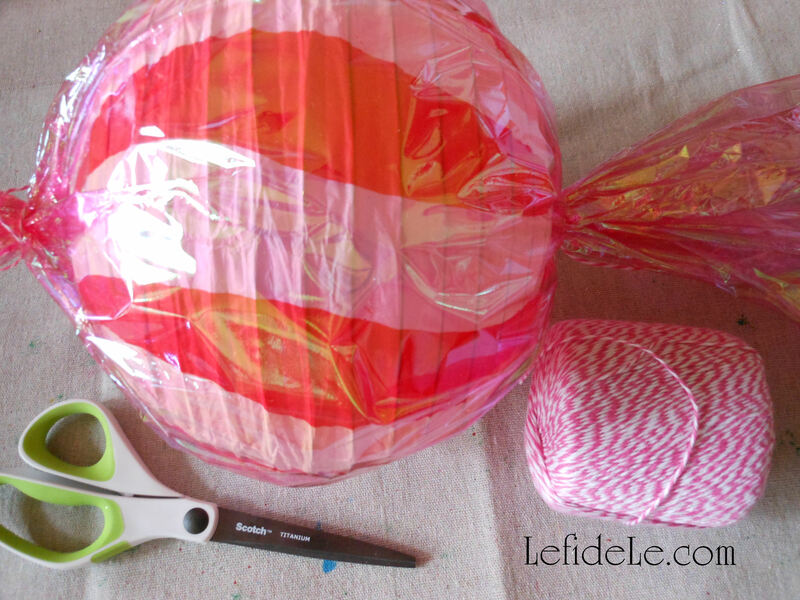 Old-school paper lanterns may easily evolve into supersized hard candy confections with a few simple steps. Begin with any variety of sizes and colors (but choose lighter versions if you wish to light them). 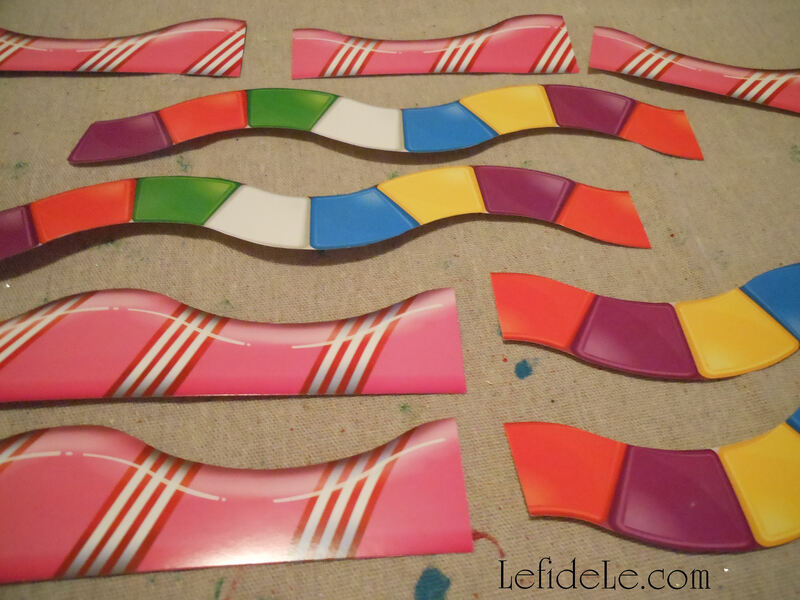 You can even find some in a candy swirl pattern like these red and white striped kinds in graduated sizes… or just start with white and add your own stripes. Craft paint is quicker, but marker works as well. 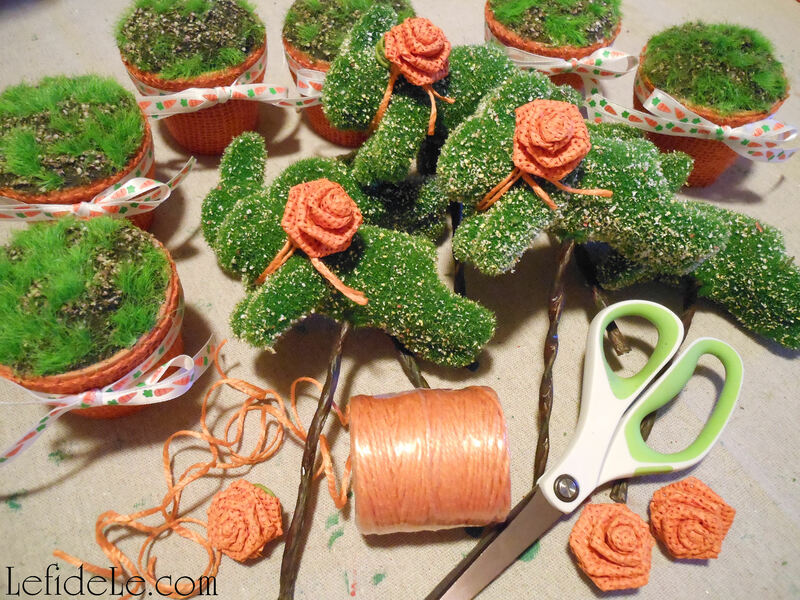 Tie a loop of twine, ribbon, or fishing line to the top of each lantern to hang them by later. 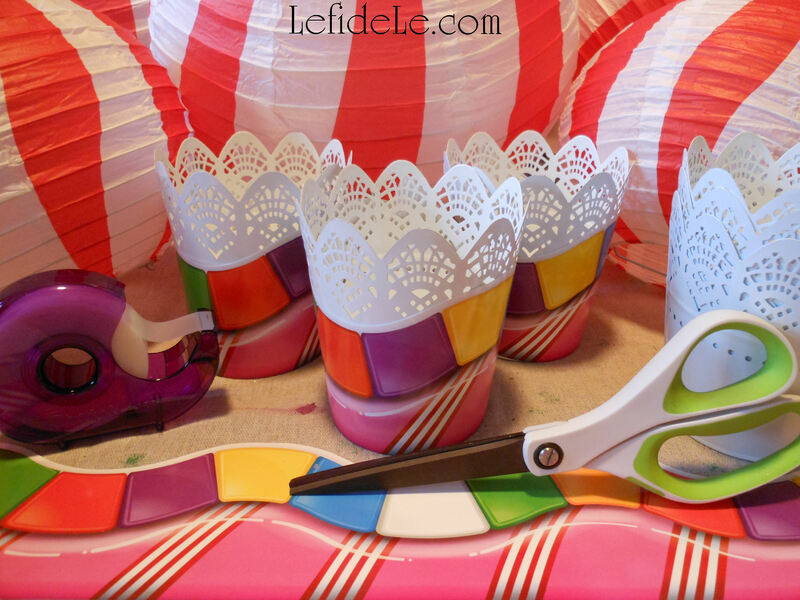 Use a theme coordinating color of gift basket cellophane to wrap around each lantern. Be sure the ends overlap before cutting. 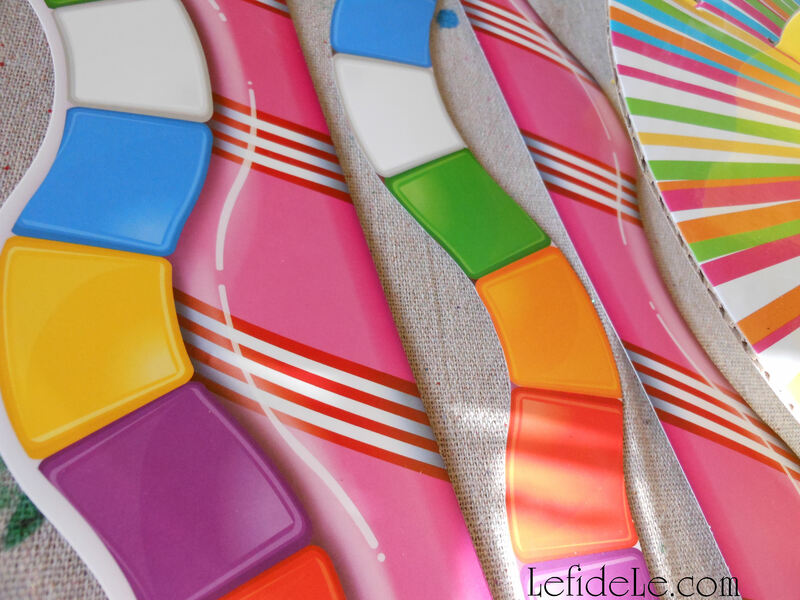 I used opalescent pink so that the red stripes would show through as hot pink. 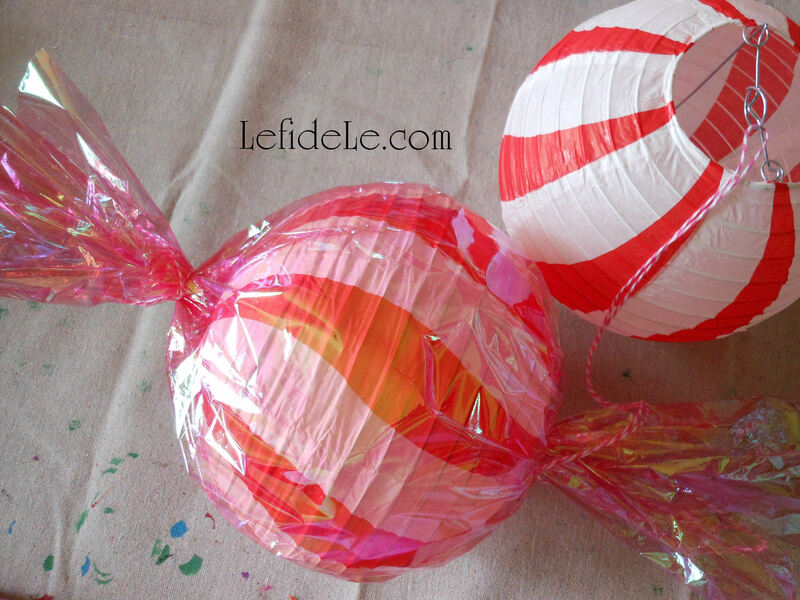 This way I can reuse the lanterns later with a clear wrap as peppermint candies or without wrapping as striped beach balls in summer. 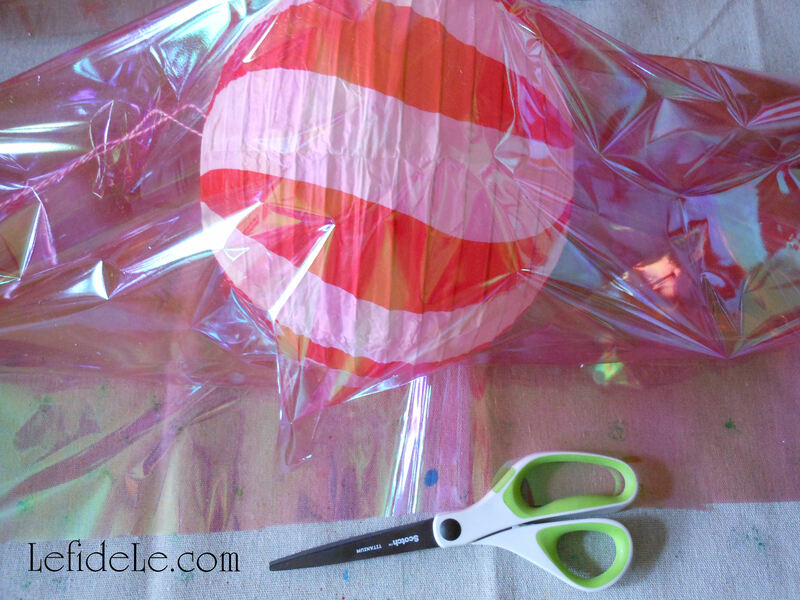 Tie a length of twine or ribbon to gather the cellophane at the lantern’s base. I actually used a pink and white yarn that mimics baker’s twine but is less expensive. 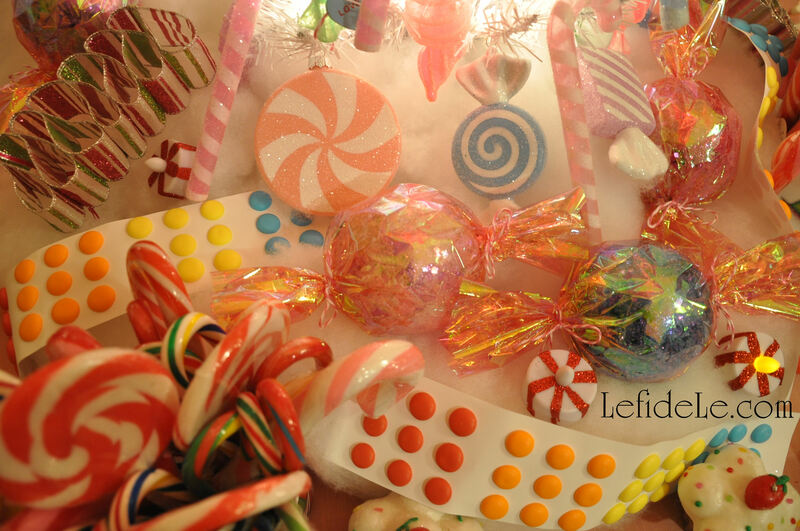 Cut off the excess cellophane from the “candy” ends so that it appears to be the right proportion. You can set these on a table, integrate them into a display, or hang a grouping of various sizes to make a hanging centerpiece. I opted to hike up the chain of my chandelier with an S-hook to shorten it. 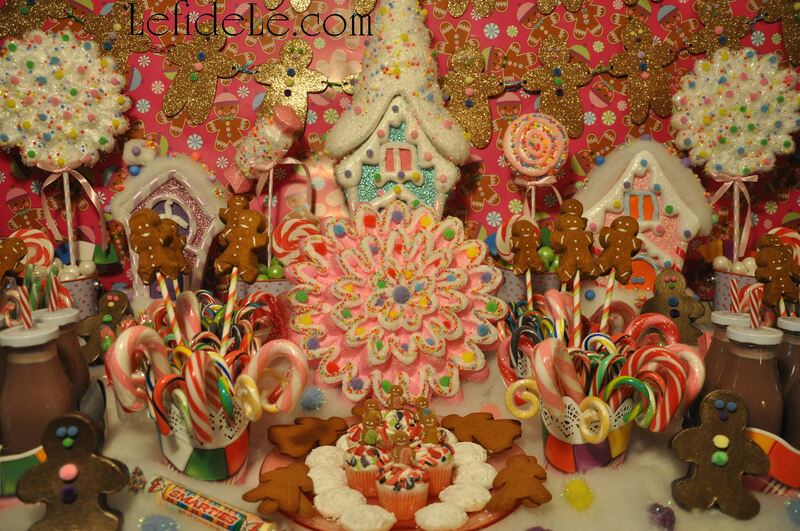 (See a picture of how to do this here: Frozen Winter Wonderland Themed Christmas & New Year’s Eve Dinner Parties.) Then I attached the twine loops with a couple inches of wire to the chandelier at different levels. 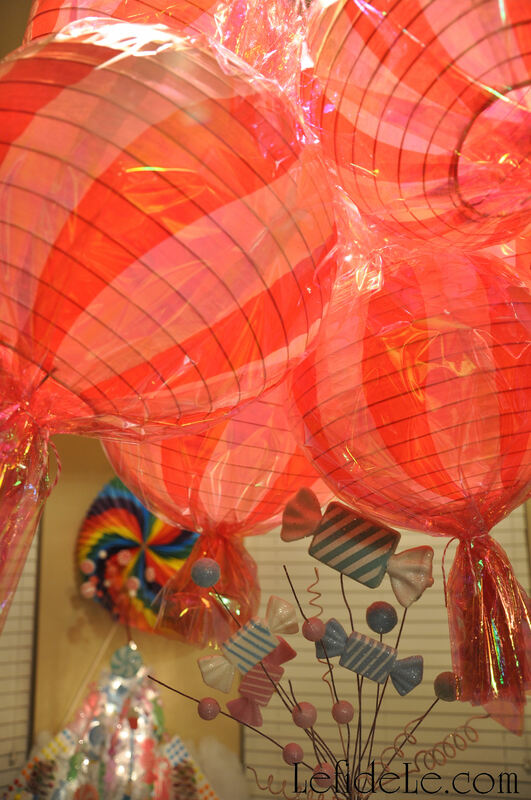 I turned the light on, and was immediately awash in a pink candy glow as the light filtered through the lanterns and cellophane. A plug-in up-light aimed squared at the lanterns will also cause them to glow in any location of your choosing. It’s much easier to do this rather than wait to light, close, and then hang your lanterns at the last minute. Of course, another option would be to purchase a light kit for each lantern then plug all those cords in… but who needs more trouble and expense? 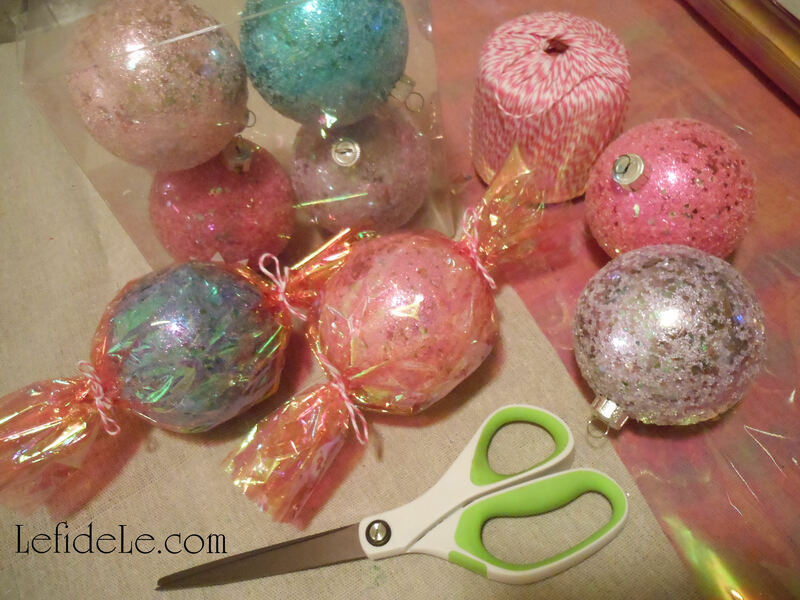 The exact same method was employed to craft the hard candy ornaments using, well… ball ornaments. The only difference was that I didn’t tie on twine hangers, because I elected to use them for table display instead. They would have been lovely hanging though. I can always add twine to string them on a tree or centerpiece later, because I intentionally left the round hanging eye stick out of the gathered wrap. It’s visually concealed by the cellophane. 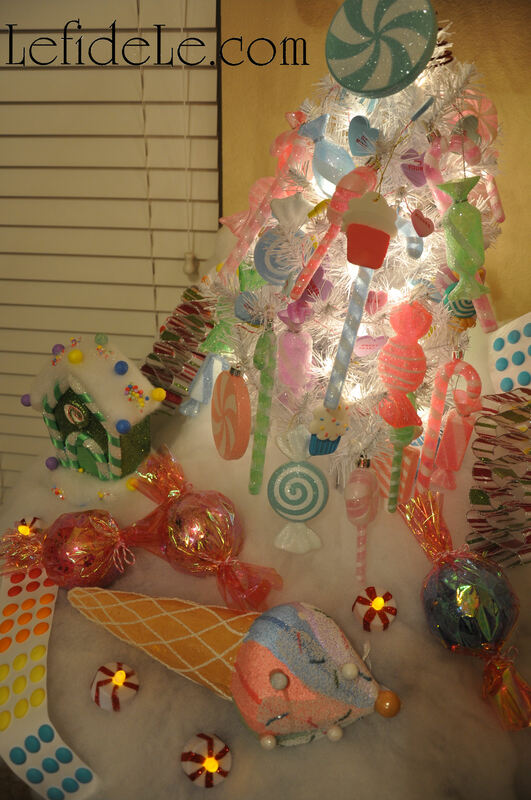 I made “big rock candy mountains” out of lit white Christmas trees that appeared to glow from within. 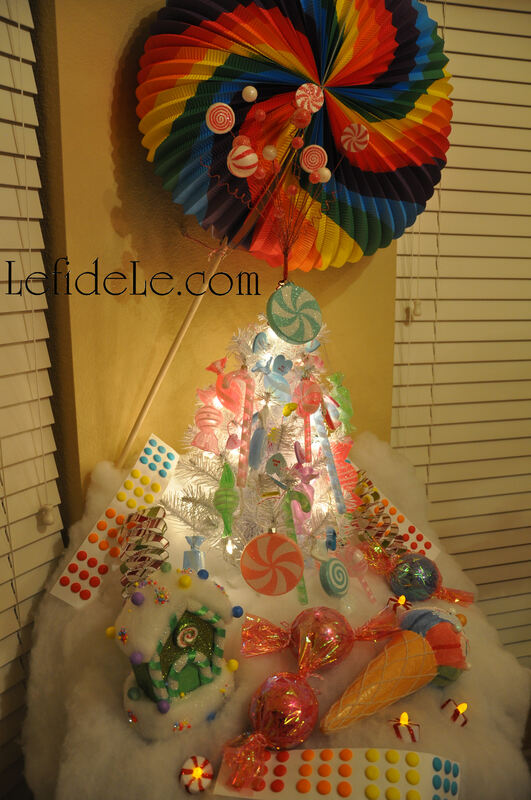 I then placed the “candy”ornaments on and around them. 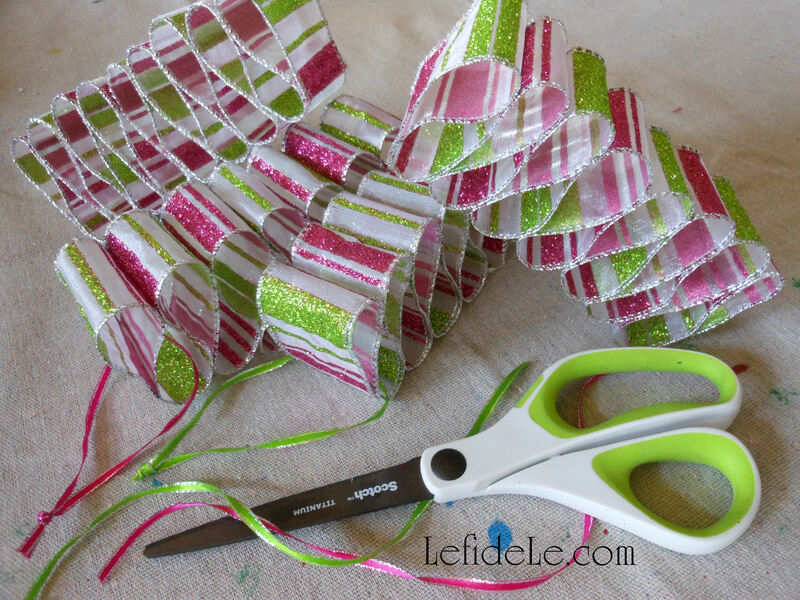 Ribbon candy ornaments are another simple décor craft that can utilize bits of leftover ribbon or even old package wrapping for an eclectic mix. I used a portion of a giant roll from Costco that is actually reserved for another project. Real ribbon candy doesn’t have glitter and has stripes facing the other way, but I thought they were adorable anyway. 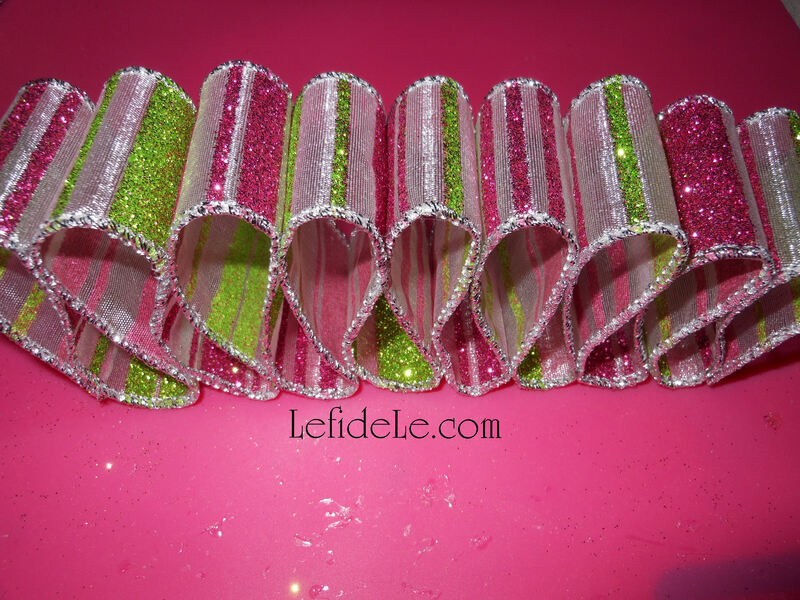 To make these, just hot glue a line onto the ribbon’s end, and tap it down to form a loop. Keep repeating this action, forming more and more loops, until you reach a size that seems proportionate to a candy dimension. Cut off the end, and glue it down to form the last loop. 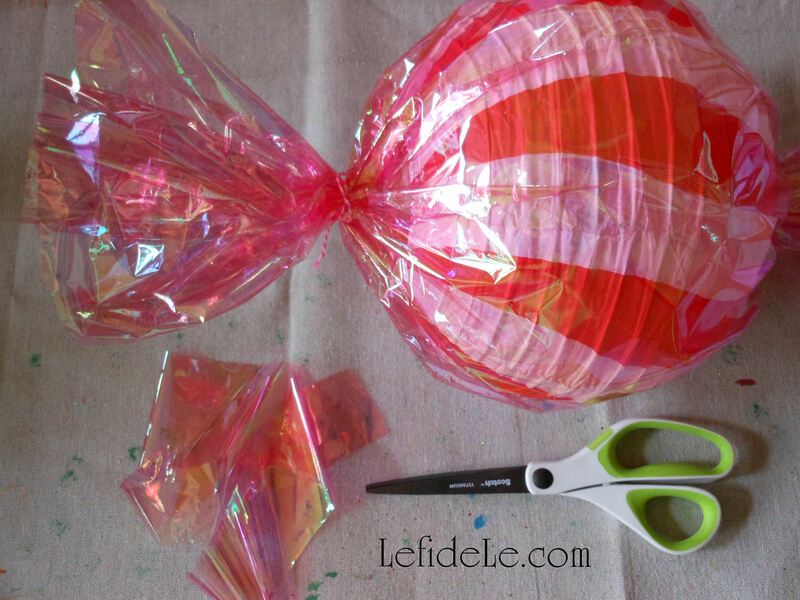 Hang these from Christmas trees, add them to a candy lantern display, or set them around a centerpiece like my “big rock candy mountains”. The “icing” bases in the picture were comprised of blankets of buffalo snow batting. 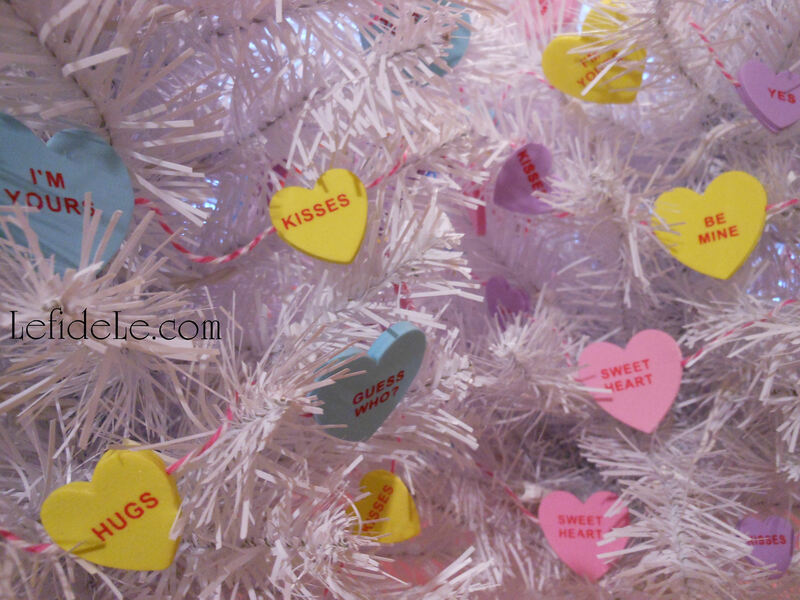 The last craft for the tree is a conversation heart garland that would serve equally as well as a banner for a Valentine’s celebration. 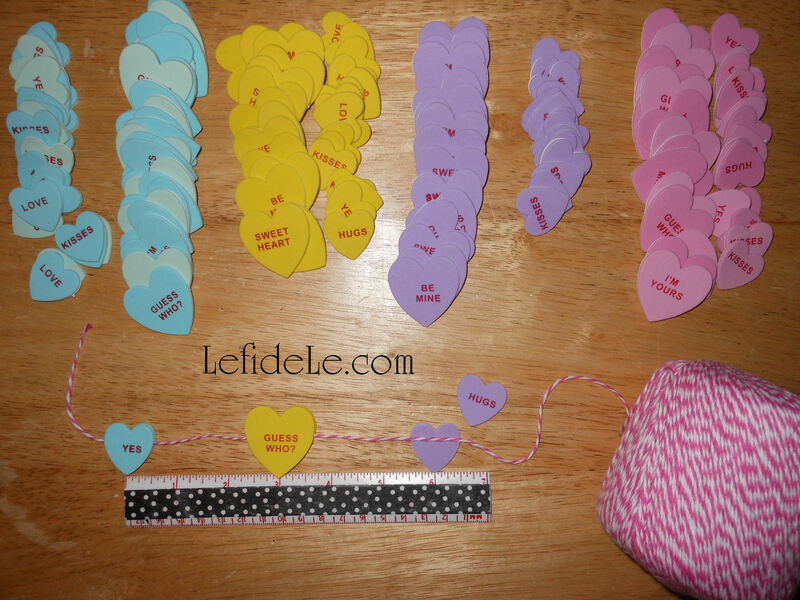 It’s so simple and inexpensive because it utilizes foam craft hearts and yarn (or thin ribbon, or baker’s twine if you like). Begin by simply setting out your hearts according to color, so that you can string them in a pleasing order. Use a ruler (or just “eyeball” it) in order to hot glue them back to back spaced 3 inches apart, sandwiching the yarn in-between. 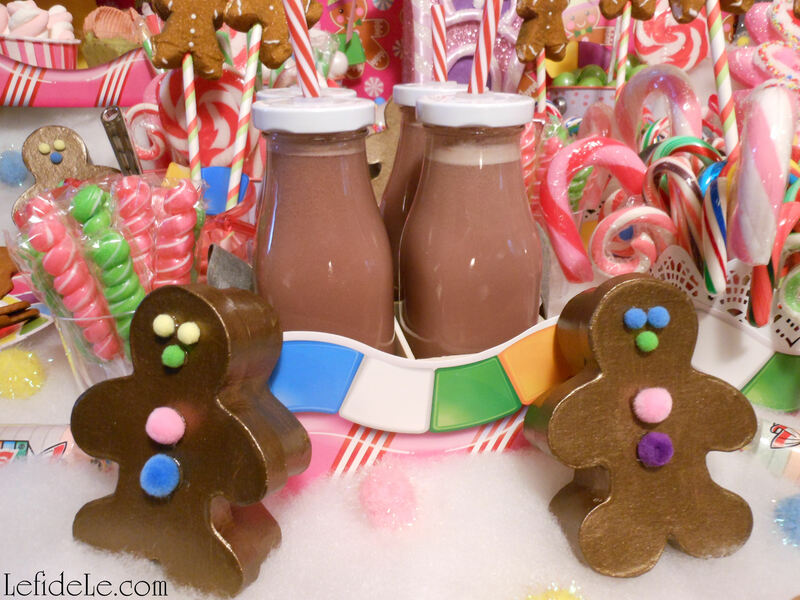 Check out the rest of my Candyland craft series: Gingerbread People Banner, Treat Gift Boxes, & Printables and Game Board Treat Tower & Easy Buffet Display as well as the final party post on Candyland Themed Party Décor Ideas. 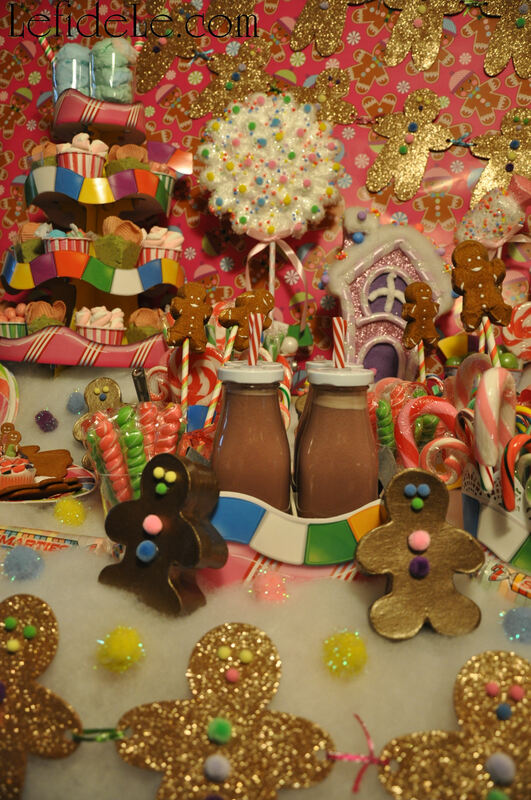 Craft your way to classic Candyland cuteness befitting birthdays, baby showers, and Christmas décor. 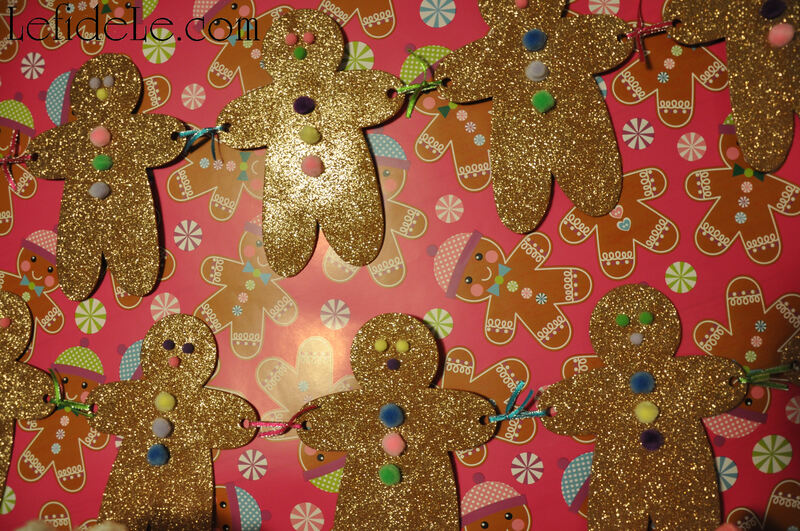 This tutorial for gingerbread people banners and treat gift boxes are part one of a DIY party decorating series with easy projects and free printables. 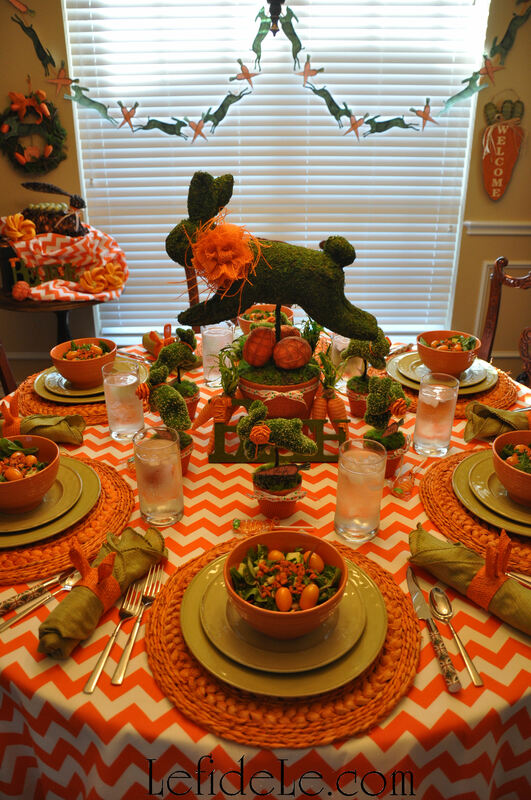 Using some or all of the ideas, you’ll be sure to delight the inner-child in all of your guests. Sweet! 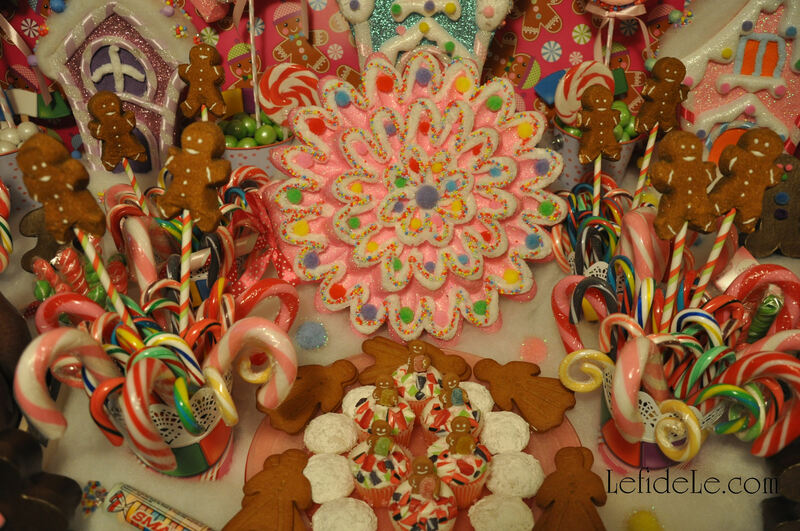 Every Candyland village needs to be populated with gingerbread people, and it can be accomplished by more than just the menu. Gift your guests with take-home treat boxes that also serve to decorate your buffet. 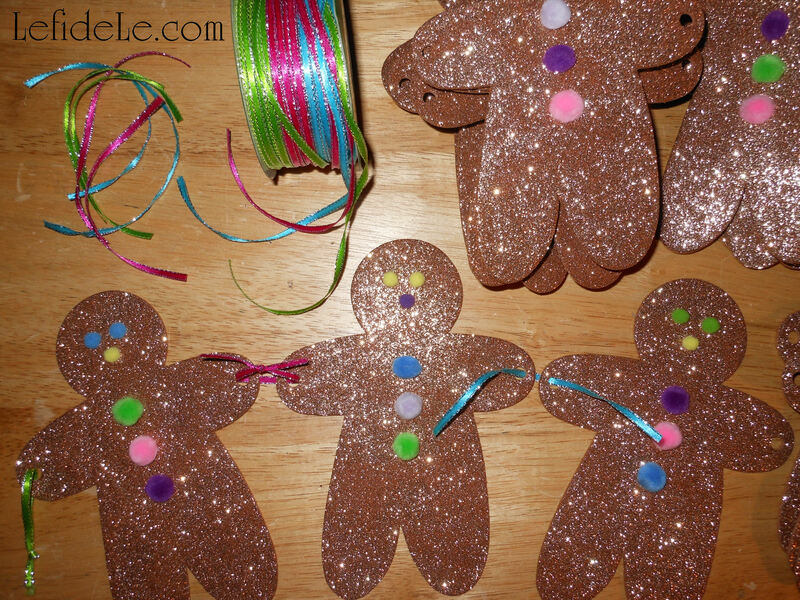 Allow them to dry overnight, then use hot glue to adhere tiny pom-poms. They make the cutest dimensional eyes, nose, and buttons! I chose colors that would coordinate with my other décor elements, and tried to intentionally randomize the combinations on each “gingie”. 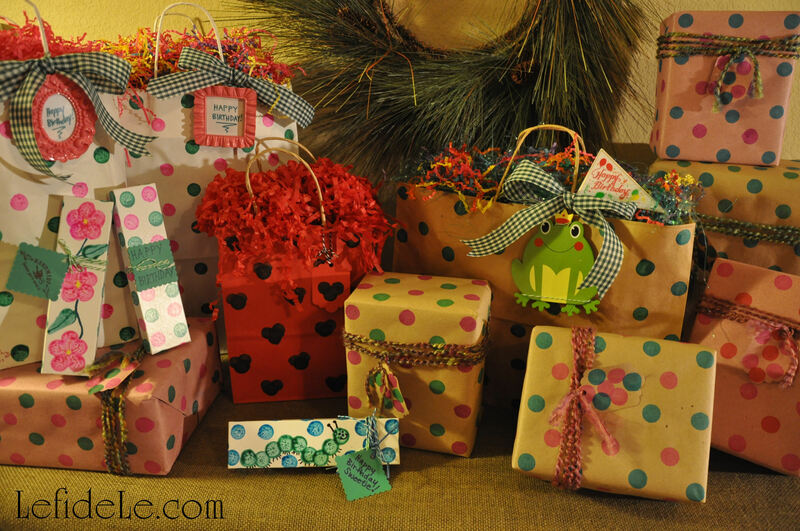 Fill your goodie boxes with candy, tiny toys, or even candy flavored lip gloss and intersperse them in your treat town. 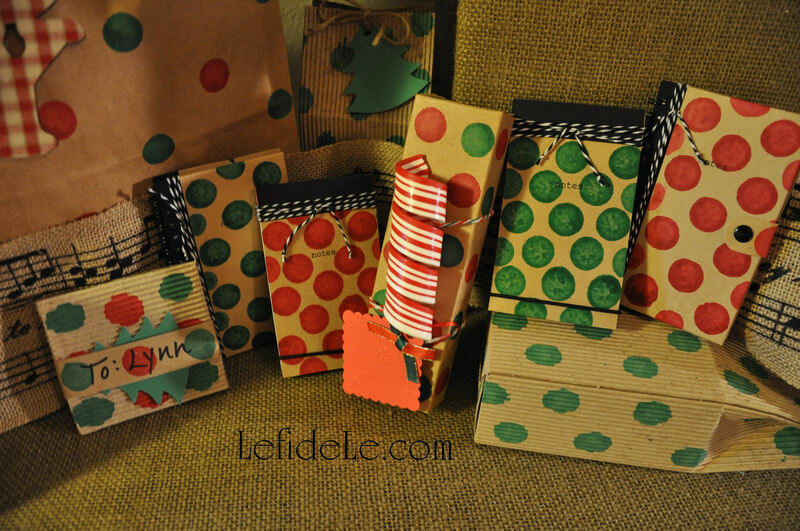 Another idea is to fill them with numbered papers that correspond to larger gifts or game elements. 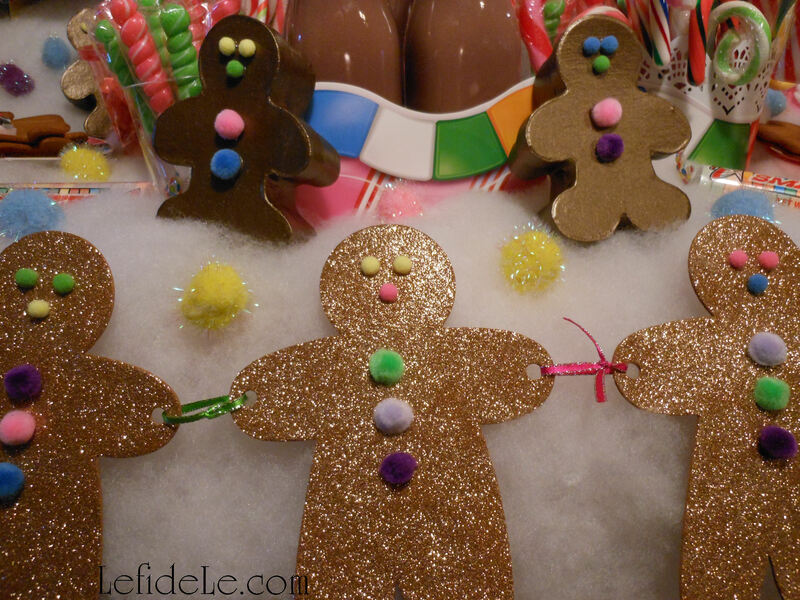 Make a banner of gingerbread people adjoined in jubilant Candyland solidarity, using one of the two following methods. 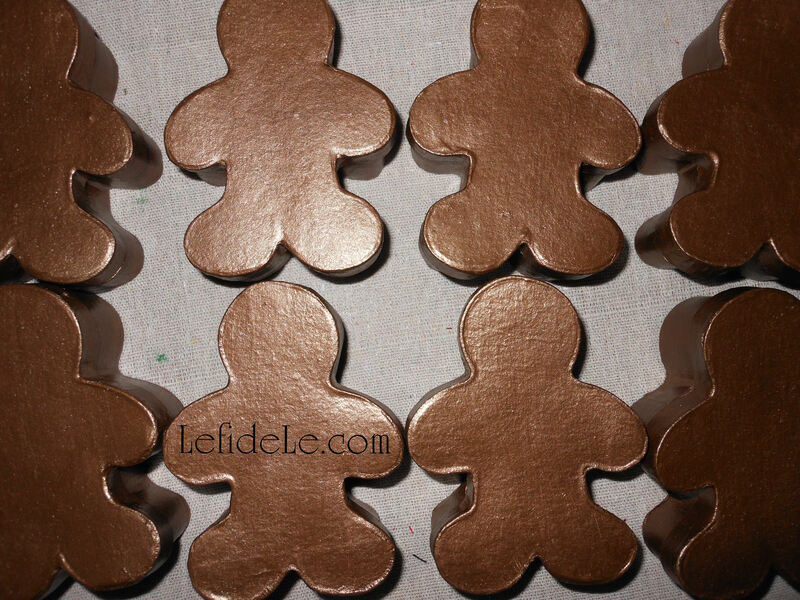 Foam gingerbread people shapes may be located at just about every craft store in the fall and winter, and may be purchased online the rest of the year. 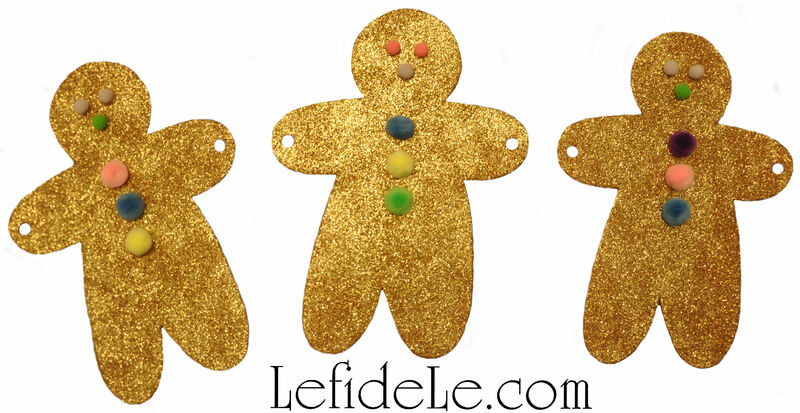 You can choose from many sizes in matte and glitter. 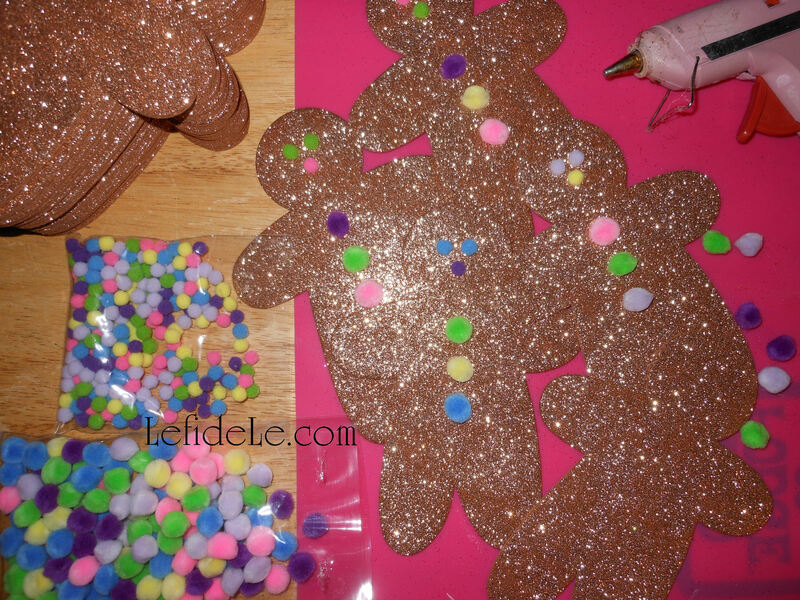 I wanted to use the glitter guys to match my houses. 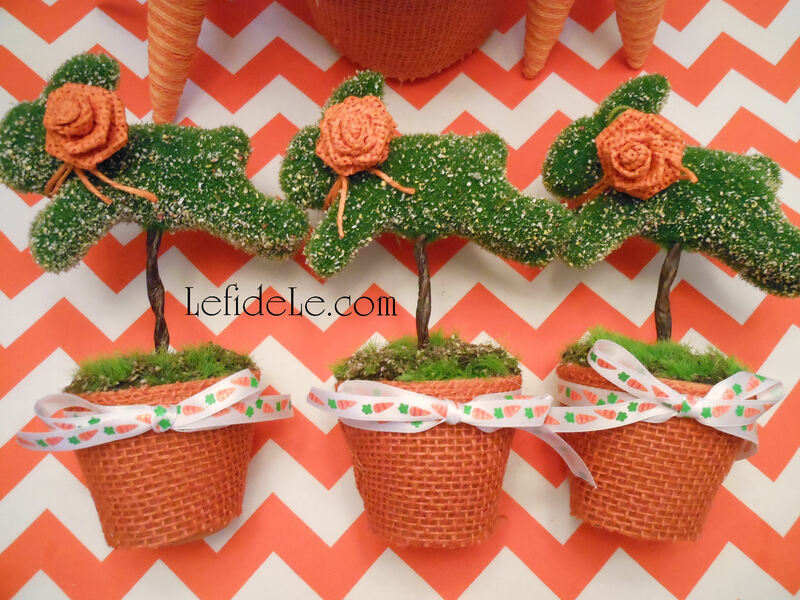 Glue on tiny pom-poms that coordinate with your décor. 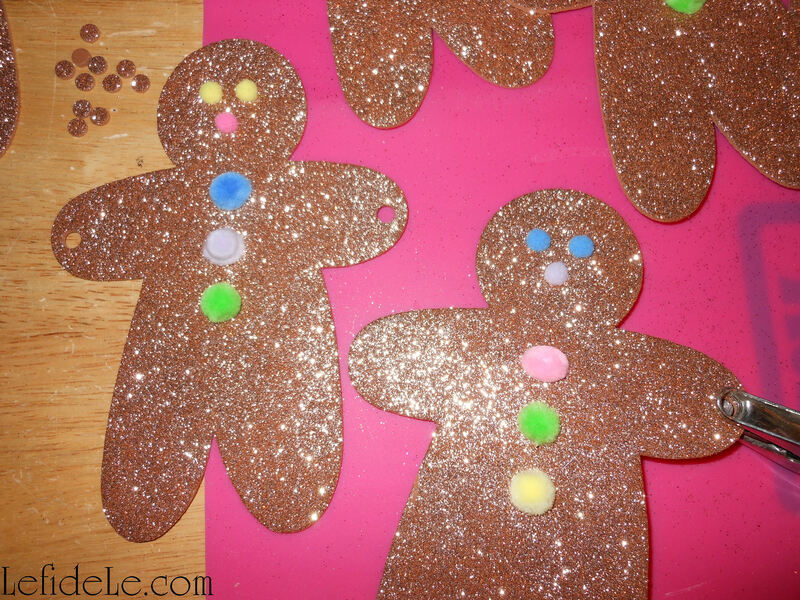 Use hot glue in the same eyes, nose, and button pattern with which you made the treat boxes. Punch a hole in each hand of the “gingies” in order to string it into a banner. Make a loop of thin ribbon through holes in two “gingies”, and tie a knot to connect them. I alternated between three different colors from the same spool of clearance ribbon. The second method is to right click on my printable image above (free for noncommercial use), and select print. 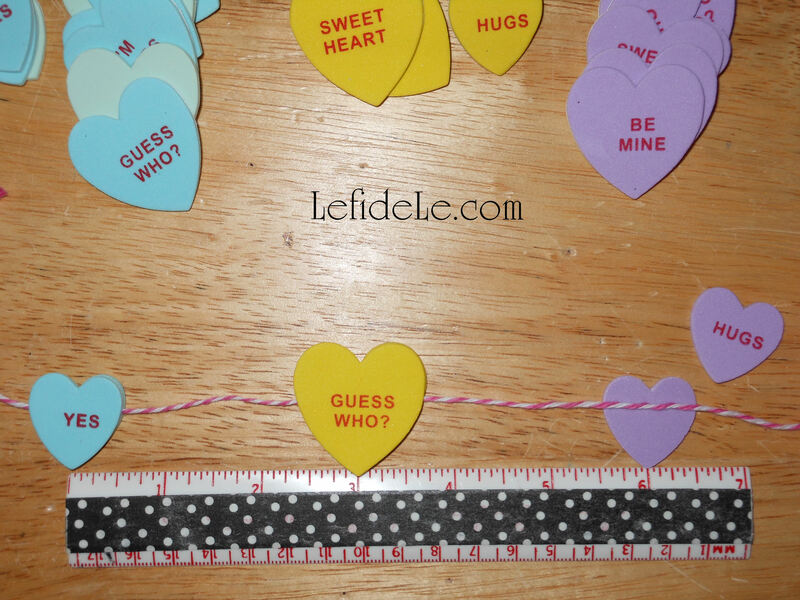 Then print them in color and photo settings on sturdy cardstock (so that they don’t curl when strung). Cut them out, and punch holes into the white circles in the arms. Choose to leave them as is, or add more glitter to the images. Then tie on ribbons to join them (as in the previous method). 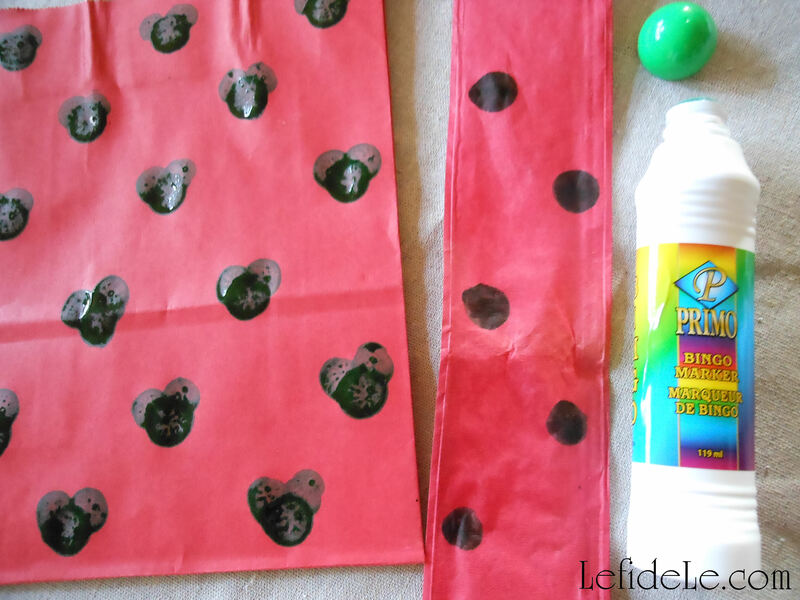 You can also glue pom-poms over the images in the prints to add dimension to your project. 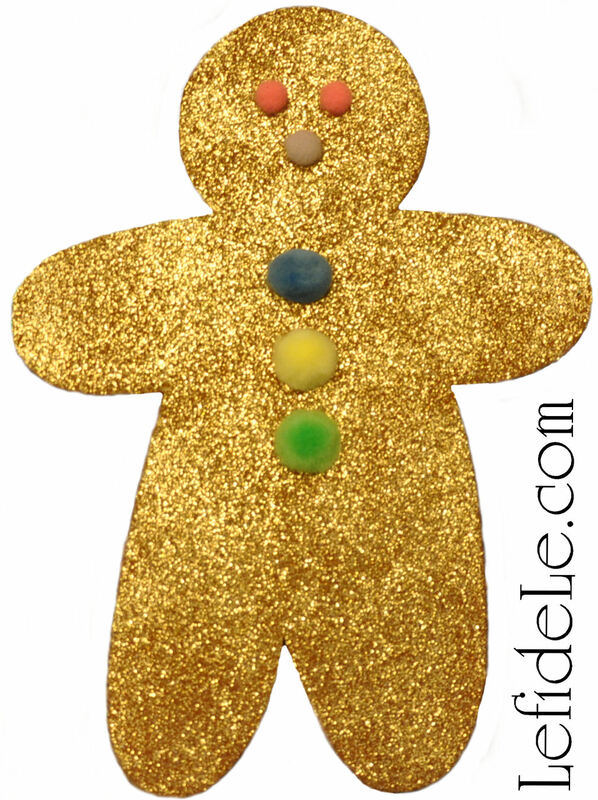 Use the gingerbread person image without white holes for other décor or signage. 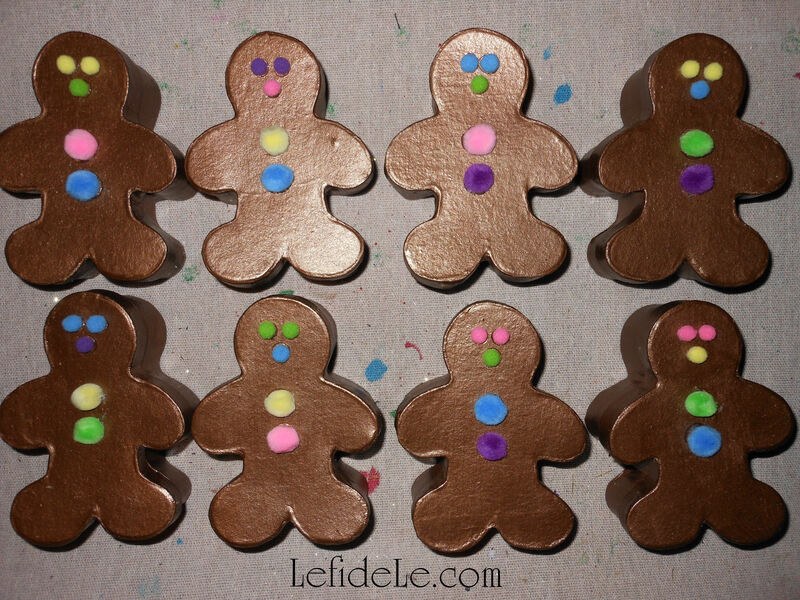 Simply adjust your printing sizes to make smaller “gingies”. Do this by printing at a smaller percentage (i.e. at 50%) or by printing them as photos (i.e. wallet size). Or… you can get Kinko’s to do it for you! 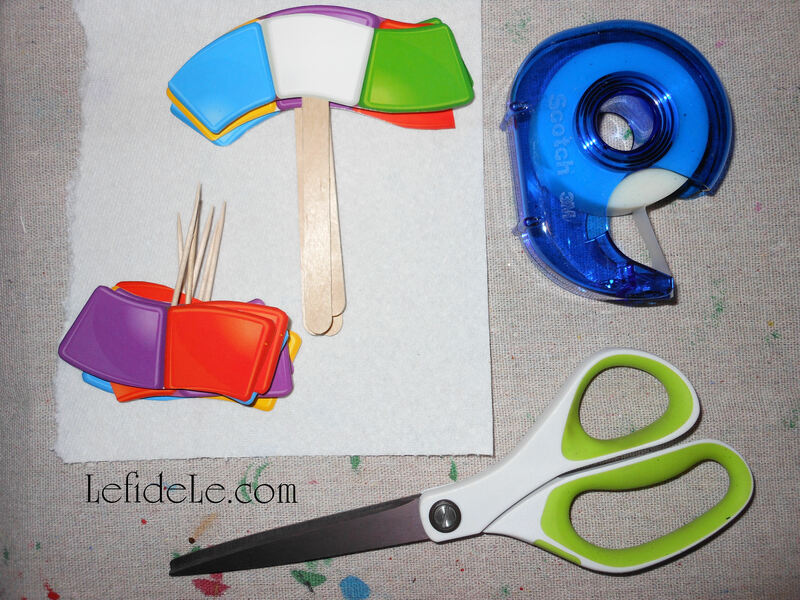 These little guys also make cute kid’s craft puppets when taped to a popsicle stick, so you can utilize them as a party activity for the little ones. 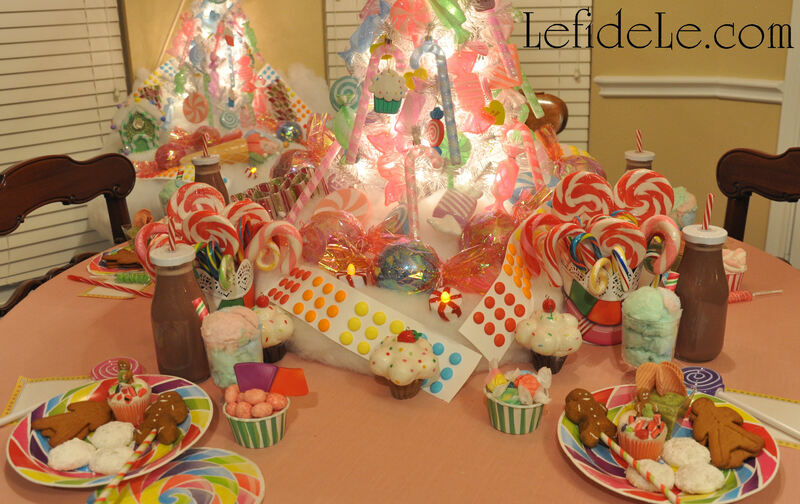 Check out the rest of my Candyland craft series: Hard Candy Lanterns, Candy Ornaments, & Conversation Heart Garlands and Game Board Treat Tower & Easy Buffet Display as well as the final party post on Candyland Themed Party Décor Ideas. With all of the miles of commercially produced wrapping paper that stores seem to stock at every corner… why make your own? Well, it can be made super-fast and super-easy without looking like it! 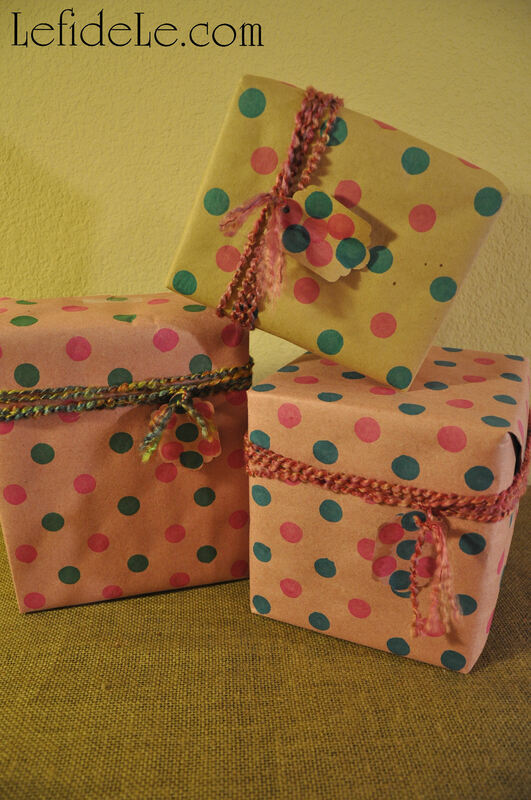 With my simple repurposing trick, you can make handcrafted gift wrap inexpensively in a matter of minutes. It’s really easy to stamp any type of package, paper, tag, card or box… even one that gets addressed and sent in the mail! 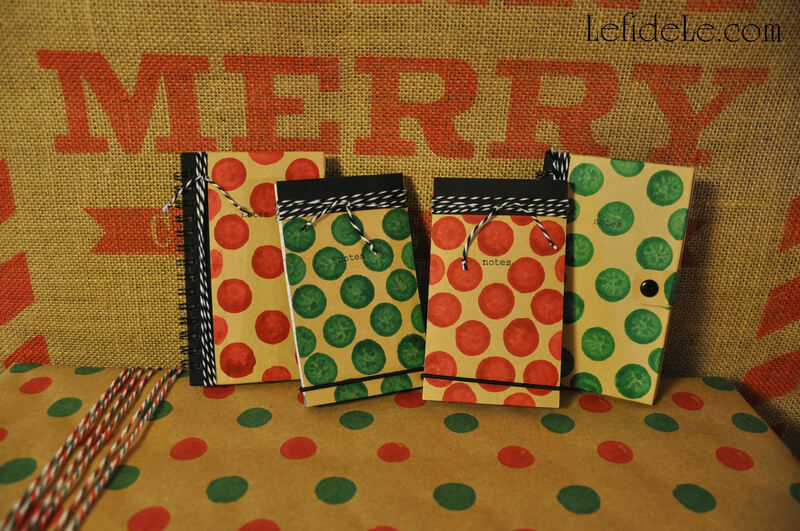 It looks even more adorable on matching notebooks, craft letters, or any other gift that would accept inking. 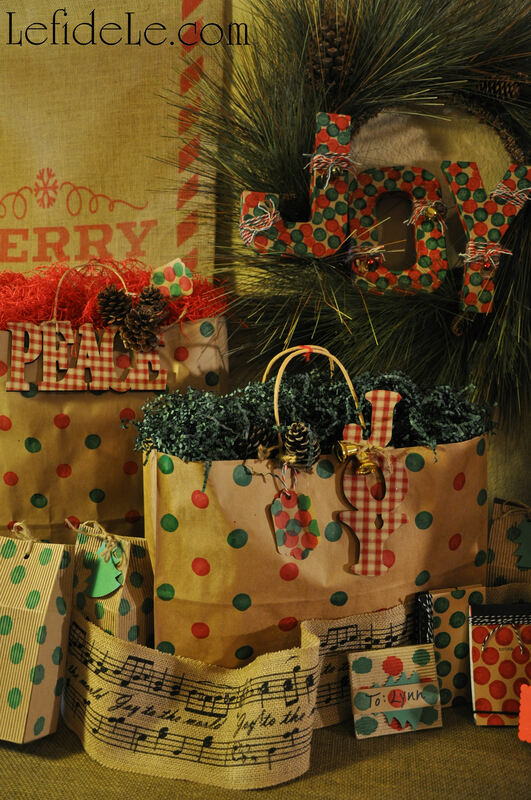 With stamping, you can match the colors to your décor for a catalog worthy Christmas, and delight loved ones with one-of-a-kind gifts at the same time. And, I don’t know about you, but I really love it when someone has cared enough to make something just for me. 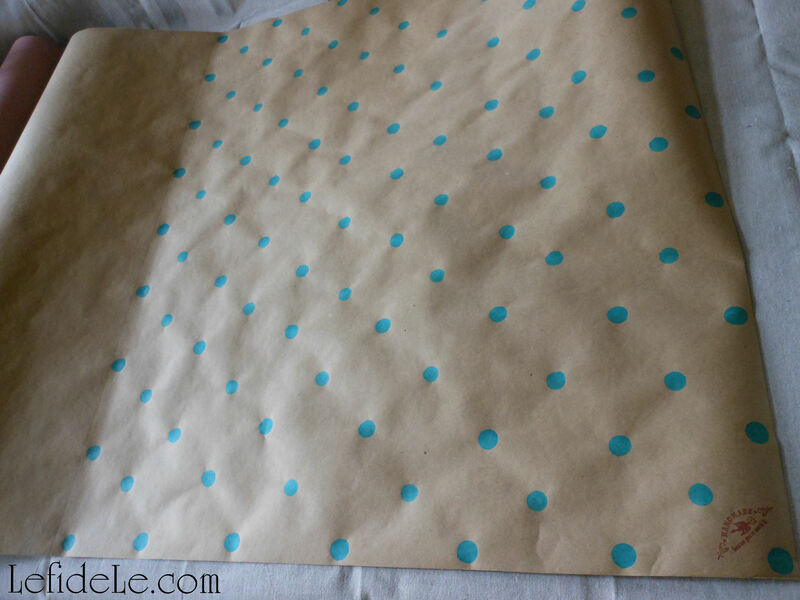 My simple trick to easy and fast polka-dot making (ahem, drumroll please)… bingo markers! The idea was sparked about 15 years ago when someone gave me a few of these because she thought I might want the ink in them. 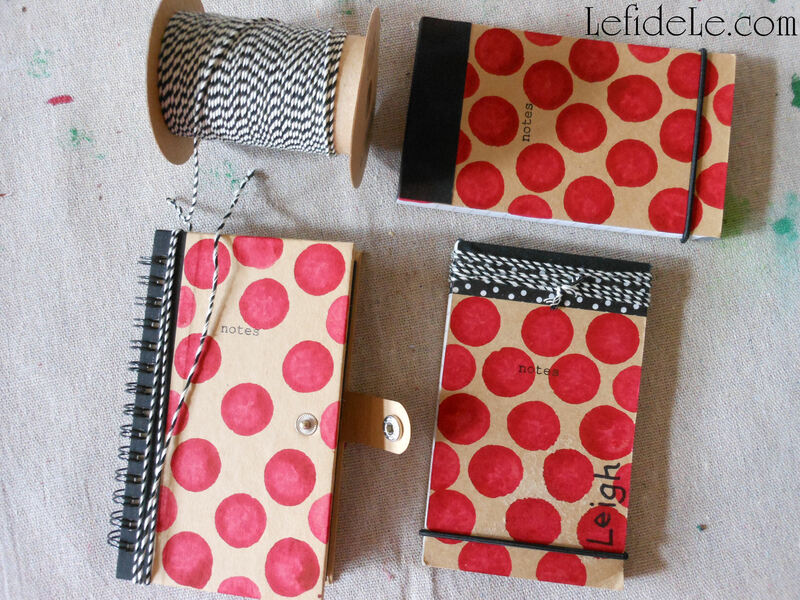 Let me tell you, I made so many spotted cards with them! Everyone was always surprised when I told them what I had used. You can find them in so many colors. I’ve used pink, green, blue, red, and purple as examples here. They even come in shapes like shamrocks or hearts, but I’m sticking with polka-dots for now because they are just so classic and chic! 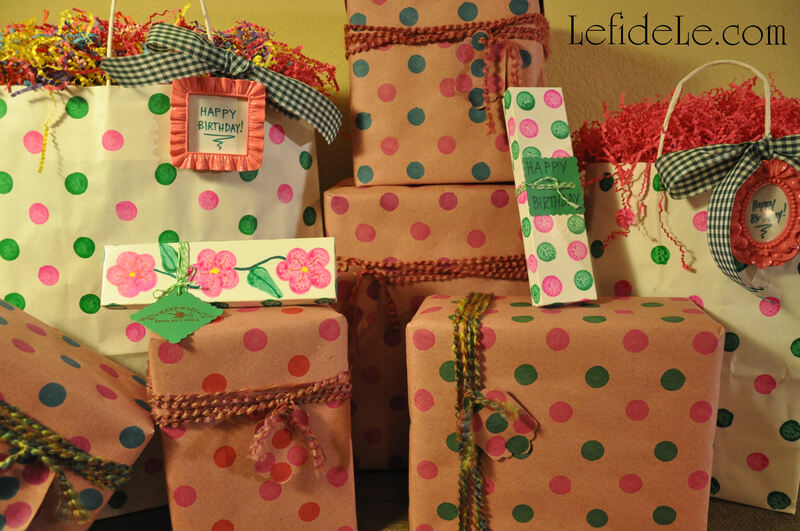 You can use any kind of paper for the gift wrap or bags. Glossy paper will leave more of a watercolor look, while matte paper will dry to a solid flat color. Both have their merits. 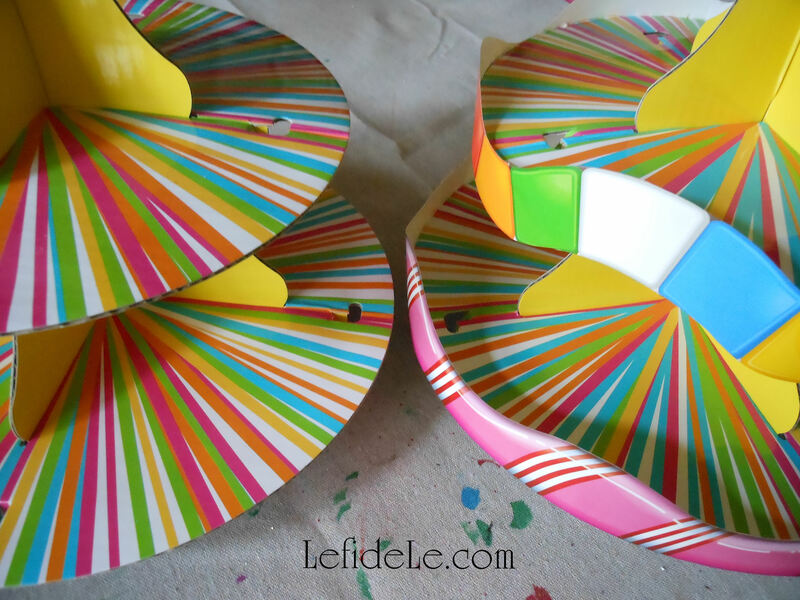 Just know that glossy surfaces take much longer to dry. 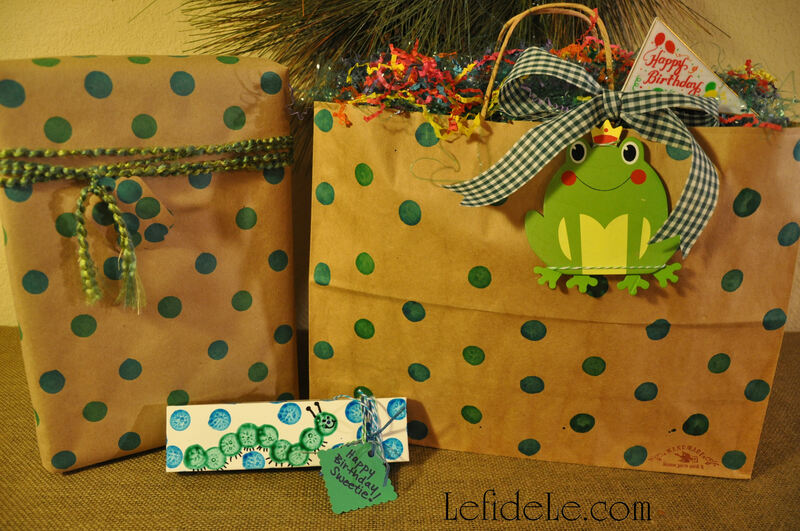 It’s great to buy neutral colored bags in white or kraft paper color, and then stamp them into personalized colors as needed. You can match your décors theme, go with traditional colors, or even pick a different color combo for each family member. Pink is my grandmother’s favorite color, so that’s just what she gets! 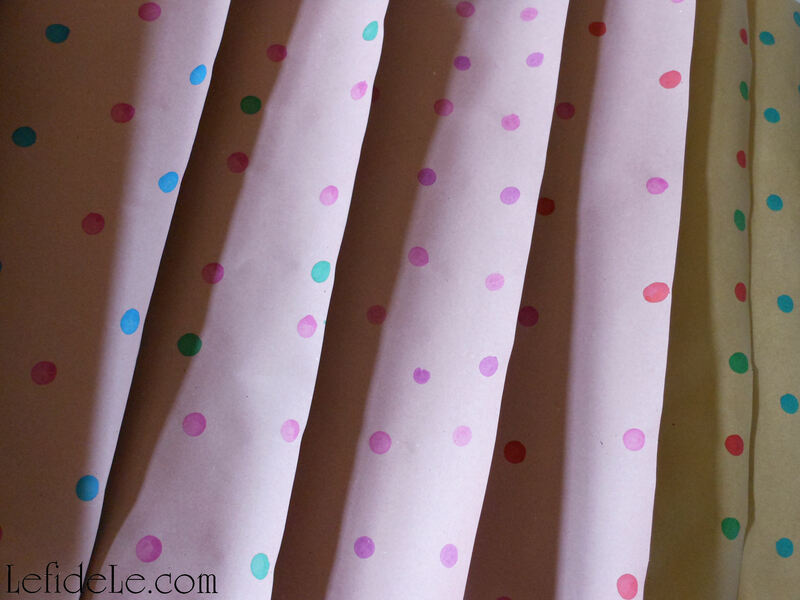 Blue and pink polka-dots are perfect for gender-neutral baby showers. 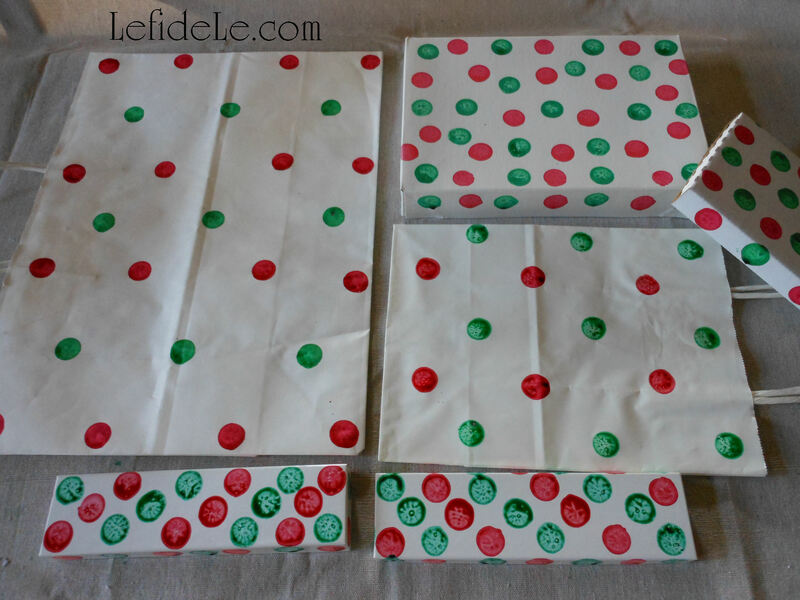 The paper I’m showing here is the best I’ve found for wrapping. It’s thick enough to hide the contents well. It won’t tear like the commercial variety in transit or mailing. It dries quickly and evenly so you can make a ton of it and just roll it back up. The tag in the picture has dry ink on pink paper, and it’s sitting atop tan with freshly applied ink. I try to stamp one color in a grid-like pattern, and then follow up in between those with a contrasting color. 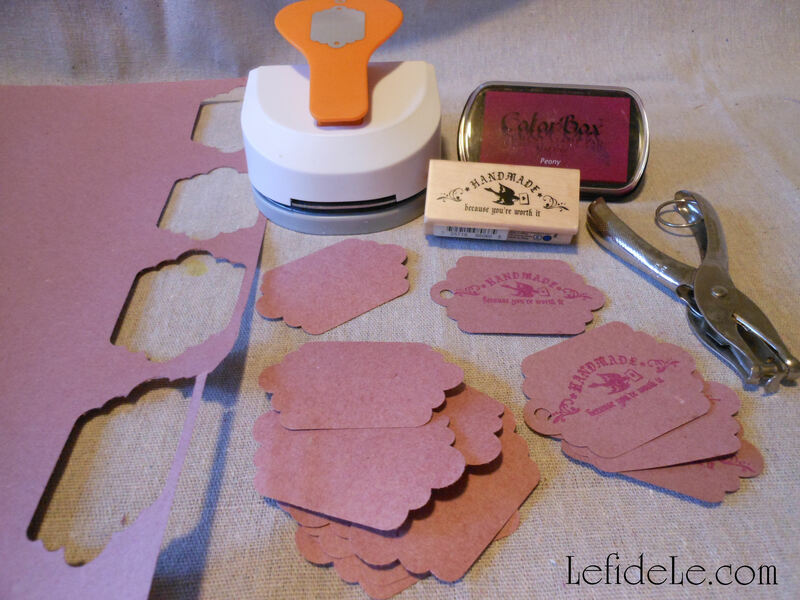 I have to admit though… sometimes it’s fun to just get stamp-happy all over the place! Do expect this when kiddos are involved. It’s fun to see the creations they come up with. 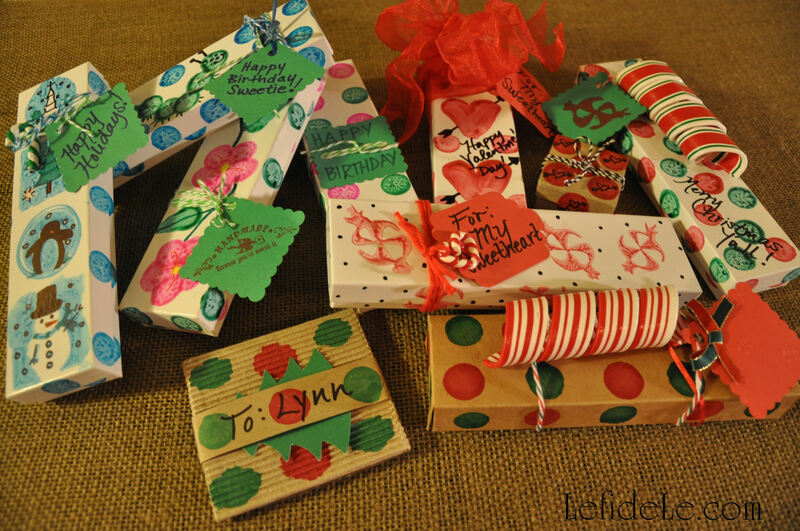 When making hand-stamped giftwrap for my Etsy store, I make long sections for wrapping purchased goods, and also package making kits complete with tag and twine. I make my individual sheets much larger (36 x 30 inches) than others typically offer (20 x 30 inches) so as to fit larger packages. Each kit will definitely cover several small boxes. 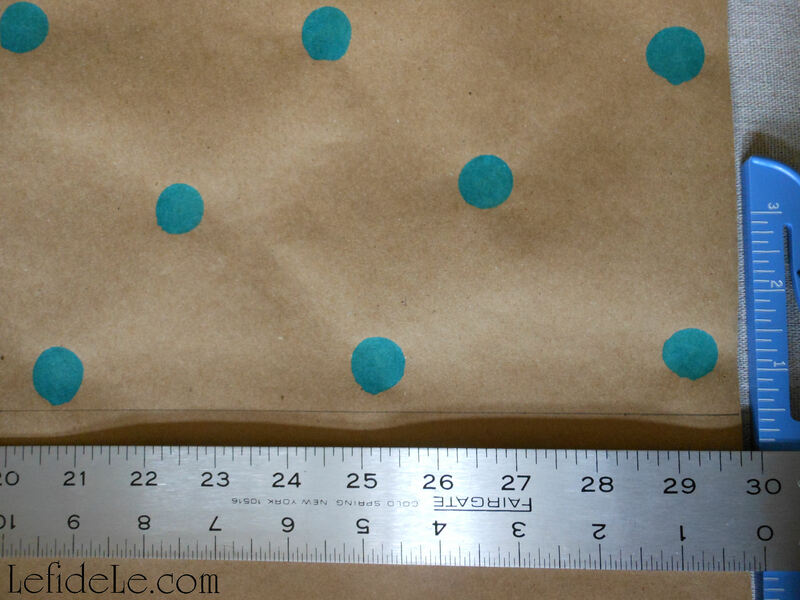 If you want to make individual wrapping paper sheets for yourself, just use a T-square ruler to measure and mark straight distances before cutting. 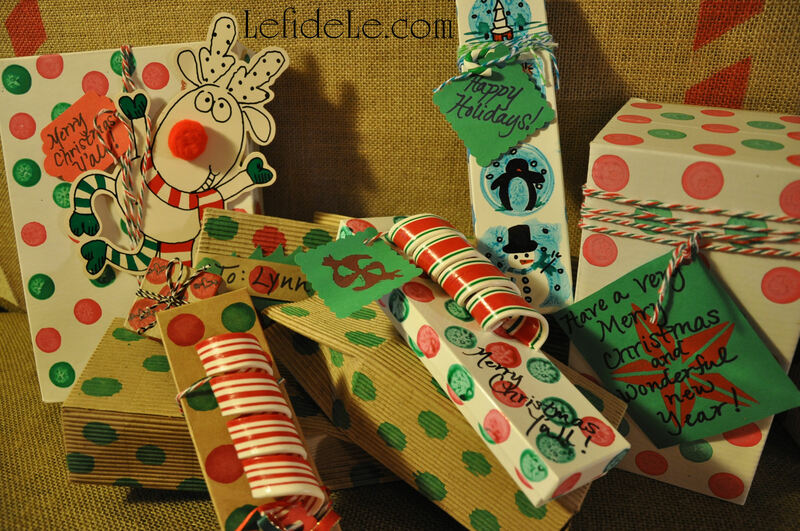 Another idea, how fun would it be to have a holiday stamping and wrapping craft party with the gal-pals! 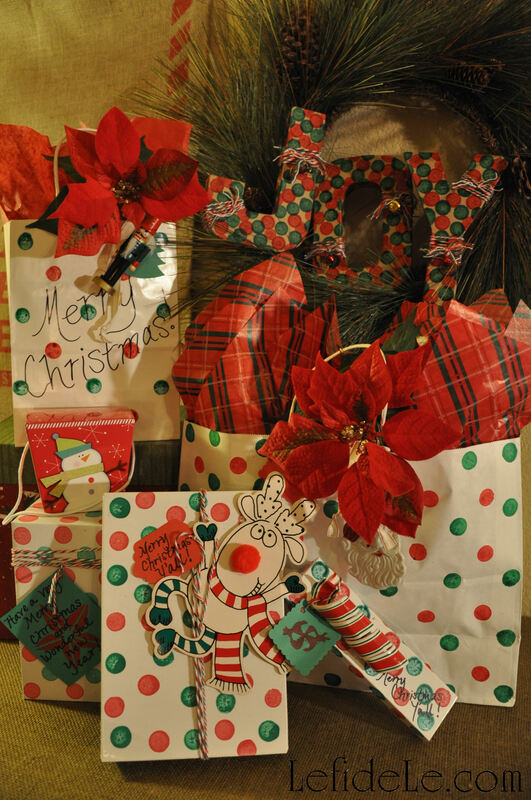 Here are traditional red and green packages for Christmas with added ornament decorations. 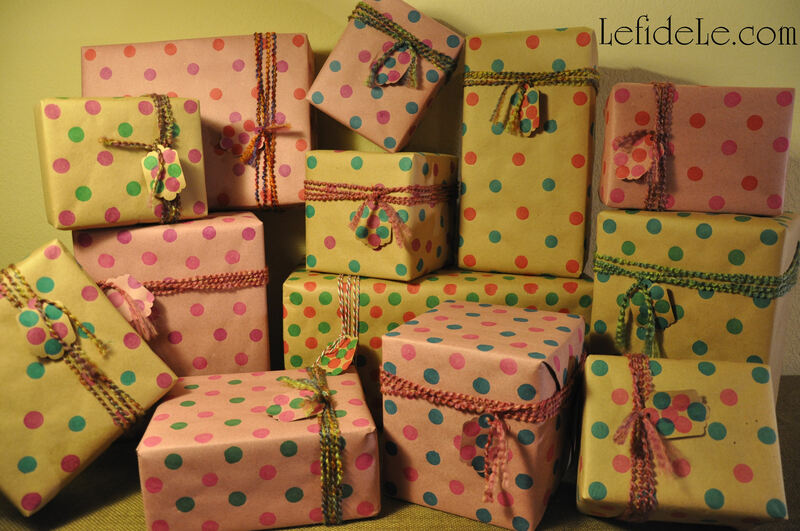 You can see for yourself the differences between glossy, matte, box, bag, and wrapping paper. I also used a stamp on them that says, “handmade for you, because you’re worth it,” as it really exemplifies what I’m trying to do… show that I care! 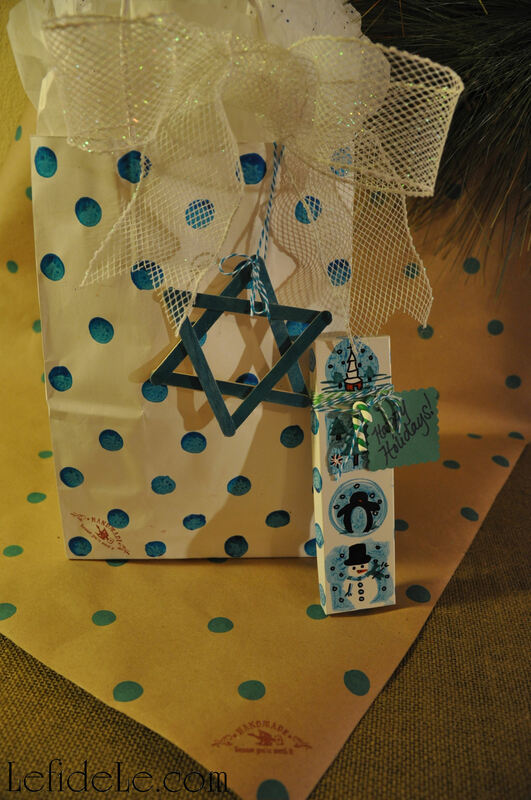 This is an idea for a friend celebrating Hanukkah. I realized I had no appropriate bag decoration for it, so I took a couple of minutes to make one. 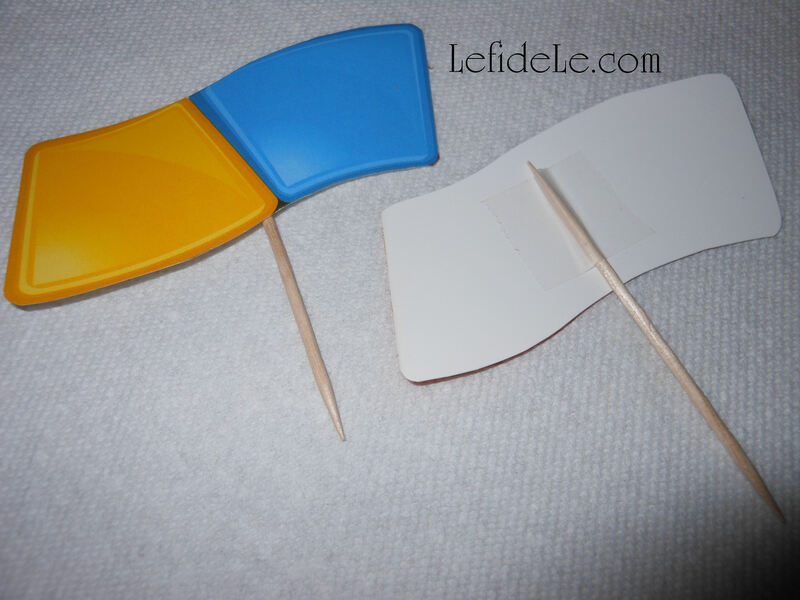 To make your own, run the matching bingo marker over 6 popsicle sticks to stain them. After they’re dry, hot glue 3 into a triangle. Repeat this with the last three, then glue one triangle on top of the other. 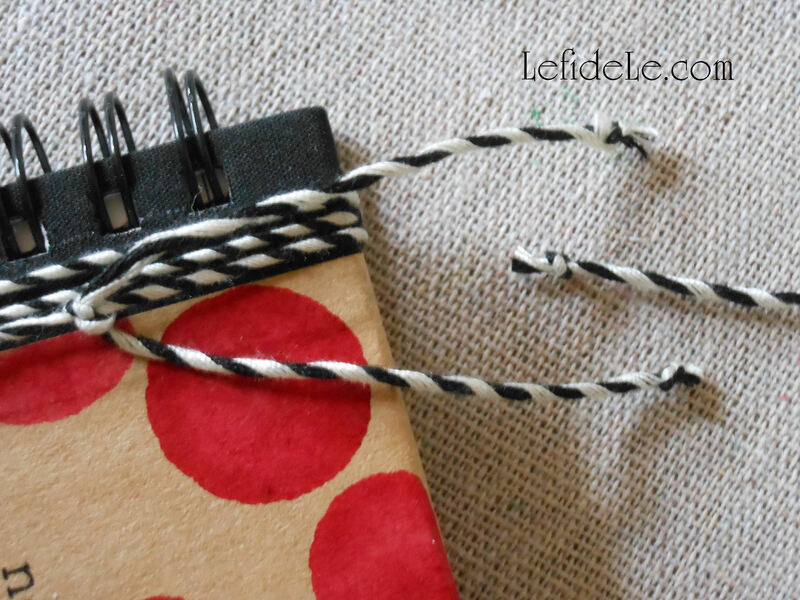 Tie on with coordinating twine, yarn, or ribbon. 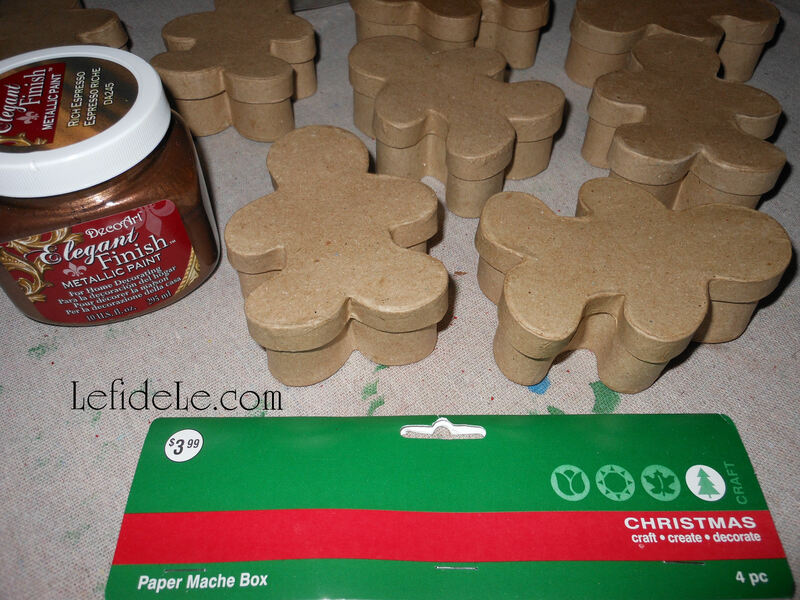 This would be a great type of Christmas craft for the little ones making ornaments for the family. 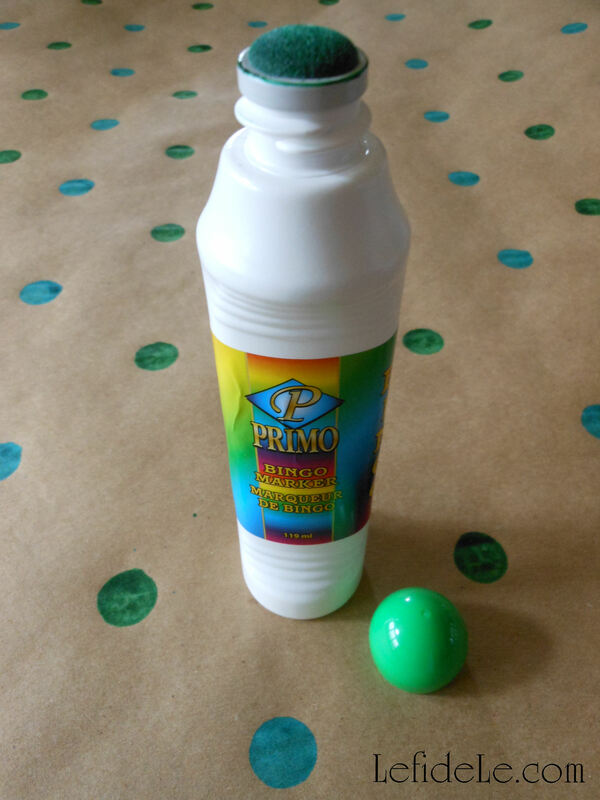 The bingo markers don’t make a big mess and the ink washes off of skin. Adding a year and a name in permanent marker would make it even more precious. 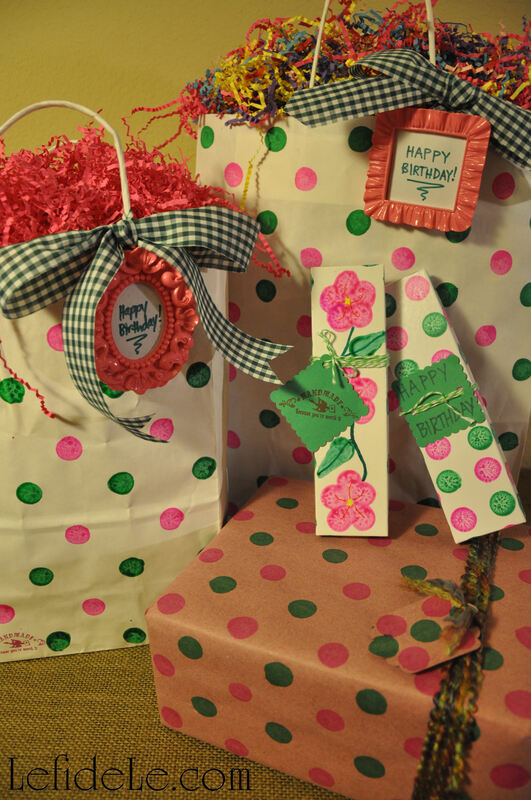 Here are some birthday gift packages with tiny frames as bag décor. 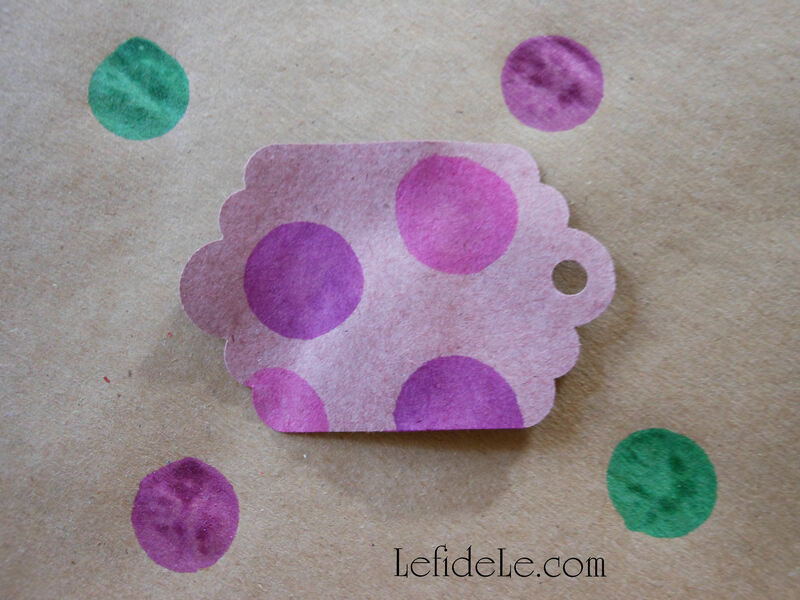 I went ahead and stamped them ahead of time because I already had everything out, and I’m planning an upcoming green and pink polka-dot theme birthday party. It fit just too perfectly! Also, I’ve made some critter themed wrap in blue and green. 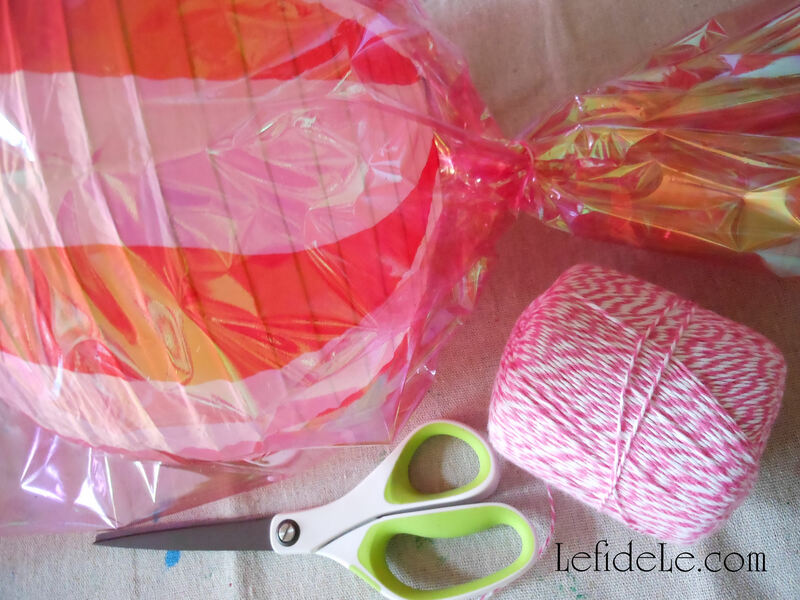 It seems like there is always a little one being born or having a birthday, so I make a point of finding theme items throughout the year for gift baskets. I can always find cute things in ducks, frogs, and ladybugs. Here are some attempts at making shapes with the bingo markers. I’m sure it probably would have been smarter to practice before doing this on the bag and boxes. Oh well, at least you can get the idea. The Mickey / Minnie Mouse bag appears to have black ink on it because green ink appears black on the red paper. 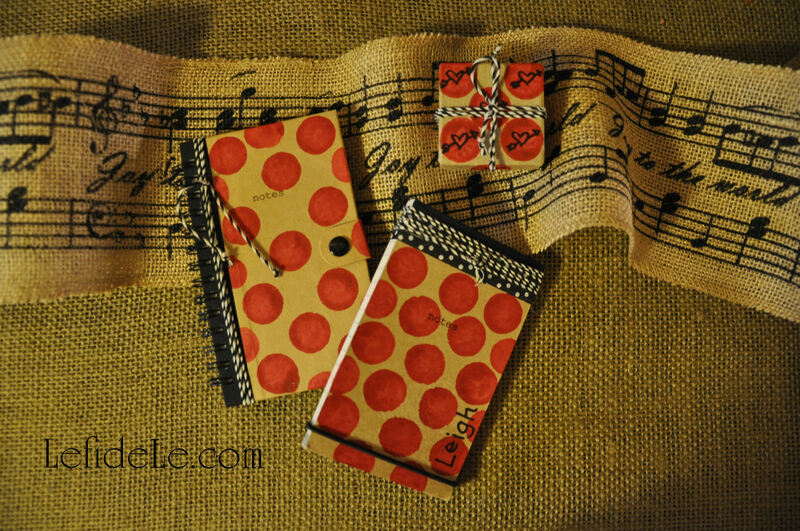 I also stamped polka dots onto a length of red paper ribbon to demonstrate the endless possibilities of decorating with ink. The green Hungry Caterpillar box just as easily could have featured a blue Alice in Wonderland Caterpillar. The hearts on the box aren’t great because it isn’t easy to make a V-point with a round stamp. Although I did get better at it by the time I made the leaves for the flowers. Just use a Sharpie to draw in details like arrows or a wavy lined stem. 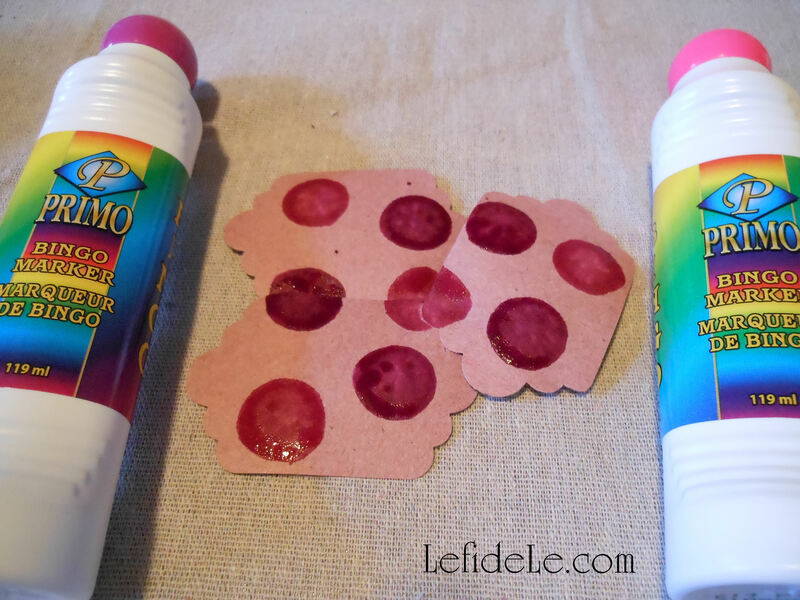 The peppermint candies were made by a foam stamp inked with the bingo marker. I thought it might work, and was delighted to find that it did! I will soon be posting a Winter Candyland Party that this type of stamp is perfect for, but here it’s used for a “sweetheart” gift box. 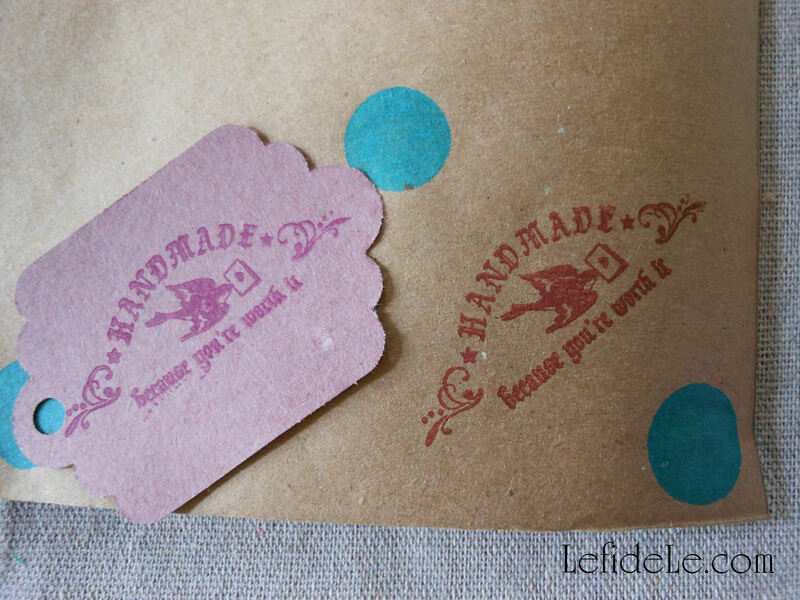 It’s really great to just stamp the outside of gift boxes, and not worry about wrapping at all! Here I’ve use some Christmas yarn… purchased with a coupon so that it was a fraction of the price of baker’s twine. I have enough quantity to be generous with it without worrying about running out… and it’s just really cute. The Rudolph decoration was manufactured, but it would be really easy to draw a silly character on poster board in Sharpie markers and glue on a red pom-pom nose. That could be a fun way to get the kids involved as well. 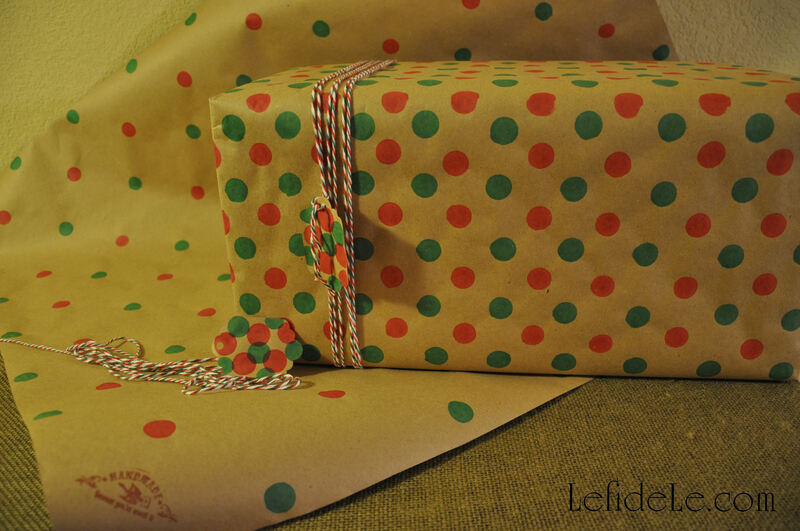 Another festive idea is to stamp the outside of a mailing parcel then write the recipient’s address in black Sharpie. 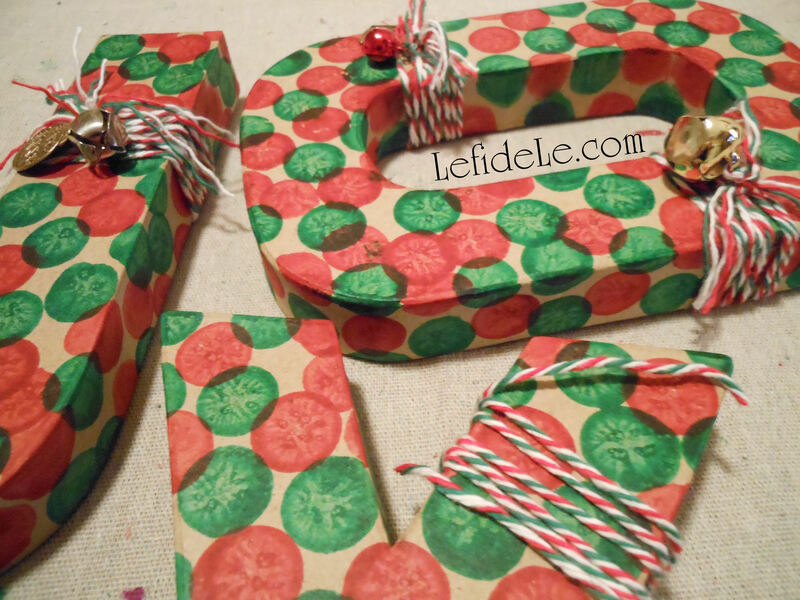 Don’t forget to make tags for your “presies”. I just used several large punches to cut them out of the same paper. 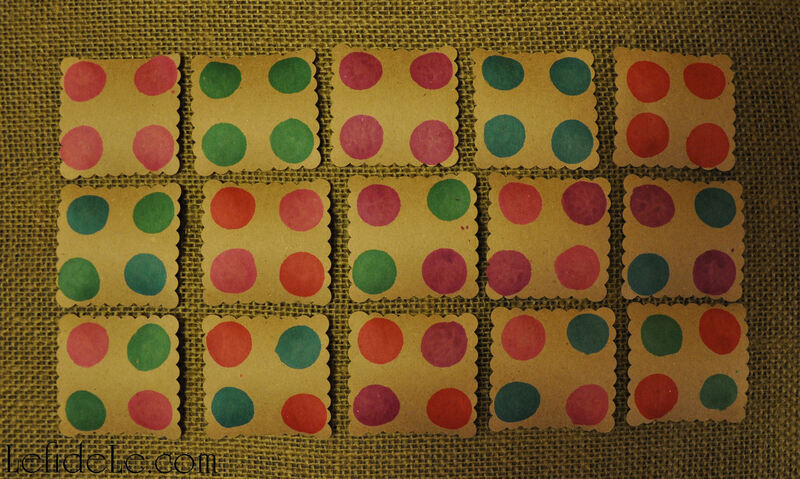 I then stamped them in assembly line fashion… proof positive that quick can be cute! I used the handmade stamp and candy stamp on some. 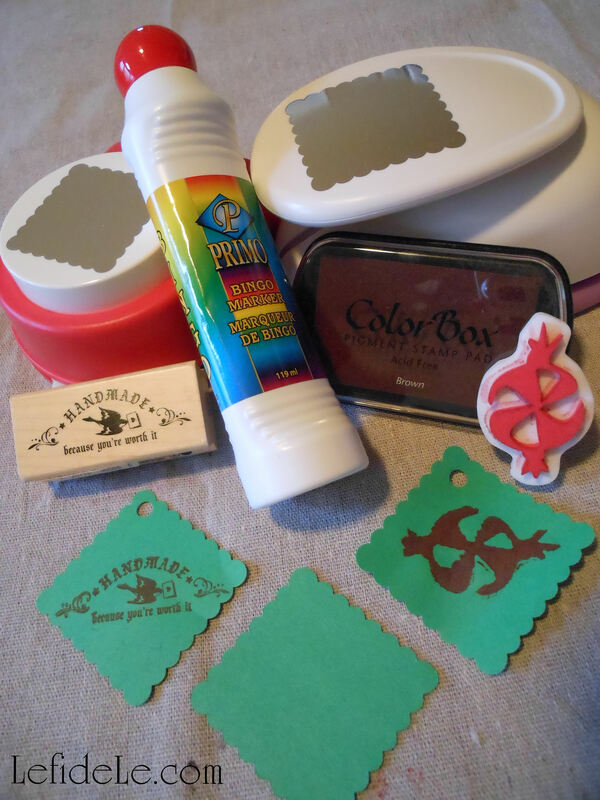 The star tag was stamped with a foam star and acrylic craft paint. This way you can see the difference between how ink and paint look. Use a Sharpie marker to write messages on any of these as pens just don’t show up well. 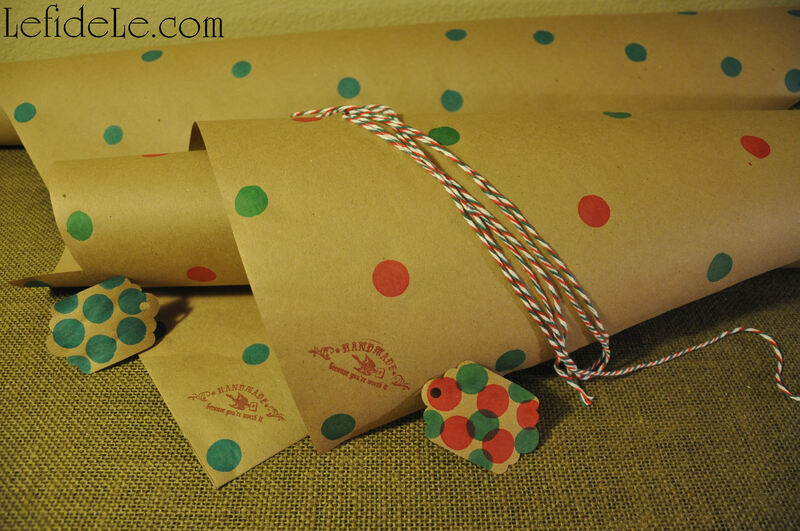 As for the gifts themselves, why not make super-quick stocking stuffers with matching polka-dots? I took boring kraft paper notebooks, and raised the cuteness factor exponentially with a little ink stamping and twine wrapping. I also added some washi tape to one whose top was peeling slightly. I personalized that one with my name in Sharpie. There is one thing which will save you some length on twine brands that have a tendency to unravel easily… tie two knots before cutting in between them. I found that the yarn that looks like twine actually unravels less. 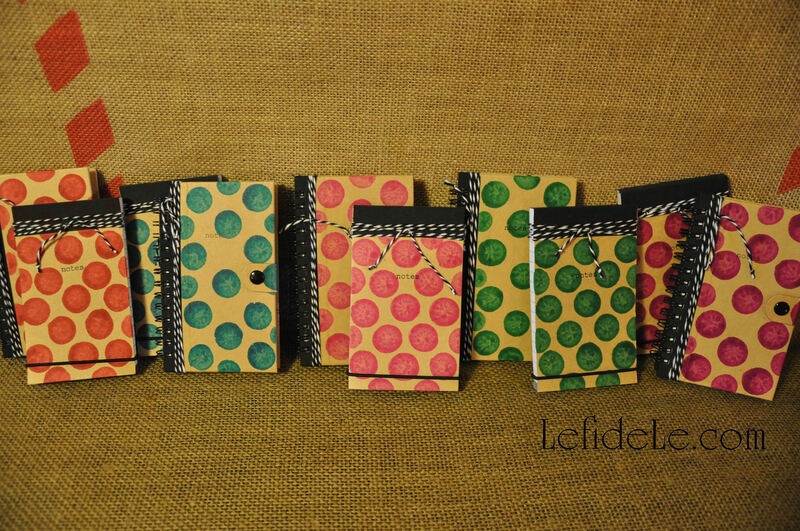 Here is a collection of my various colors of notebooks that will be made available at Le fidèLe Designs Etsy store. 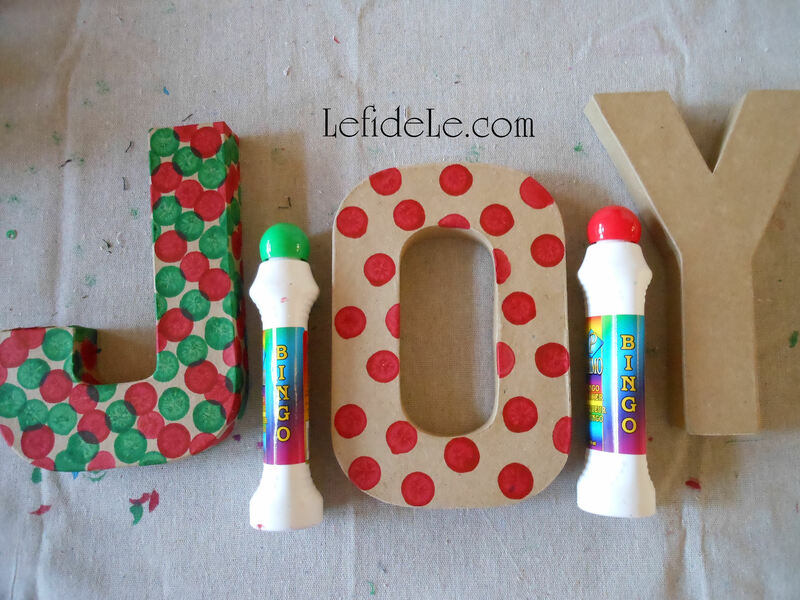 Another stamping idea that’s super-easy and fast is making message holiday décor. I bought the only “J” left in 3 stores, so JOY must be popular for the holidays. 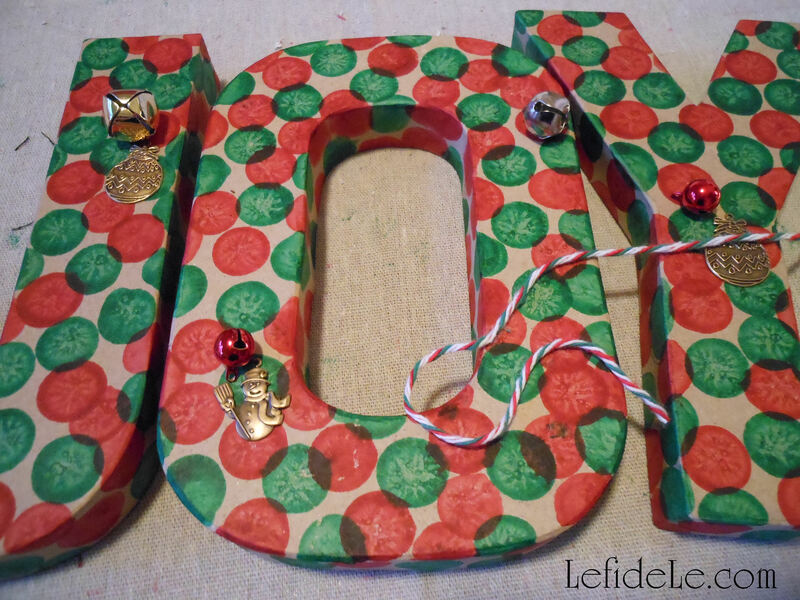 Really, any letters using different colors can be made year-round. 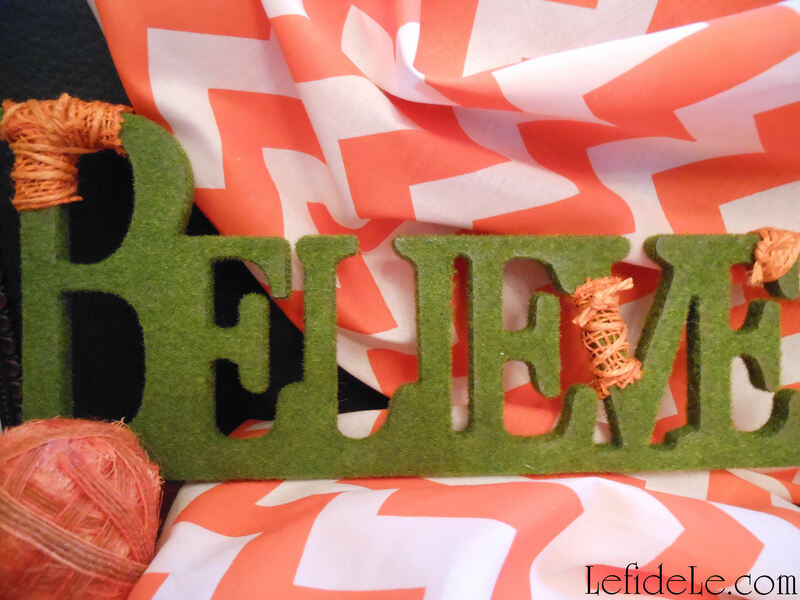 A name would make a terrific personalized gift for a little one’s nursery. 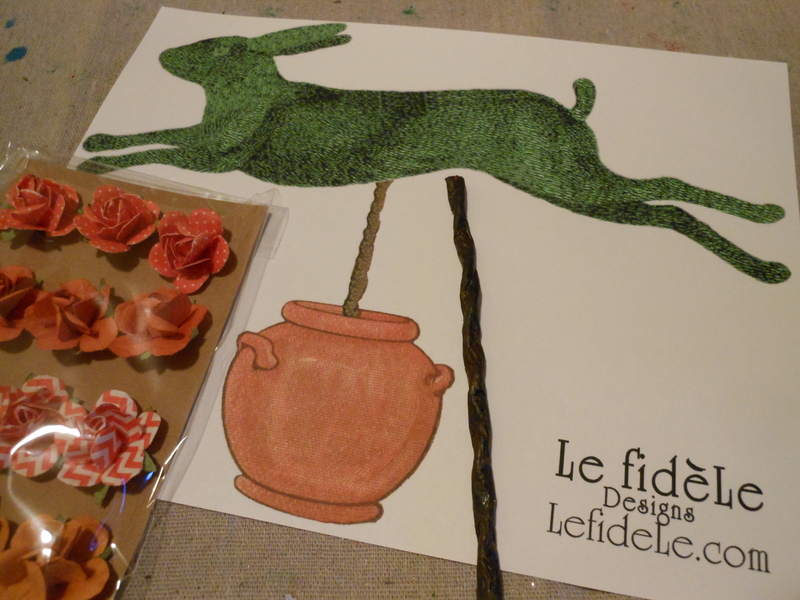 I simply stamped haphazardly with the red and green, because it was more fun that way! I went ahead and inked the back as well, for versatility. In this way I can set them anywhere, even freestanding in the bar area. Lastly, I found some holiday charms and bells to tie on with Christmas yarn. It was easy and done in a few minutes. The best part of all of these projects is that I found people really want to reuse some of the stamped wrap. (I even had one request that I not to write on the tag next time, so that she could send it forward… not the gift, just the bag and tag!) 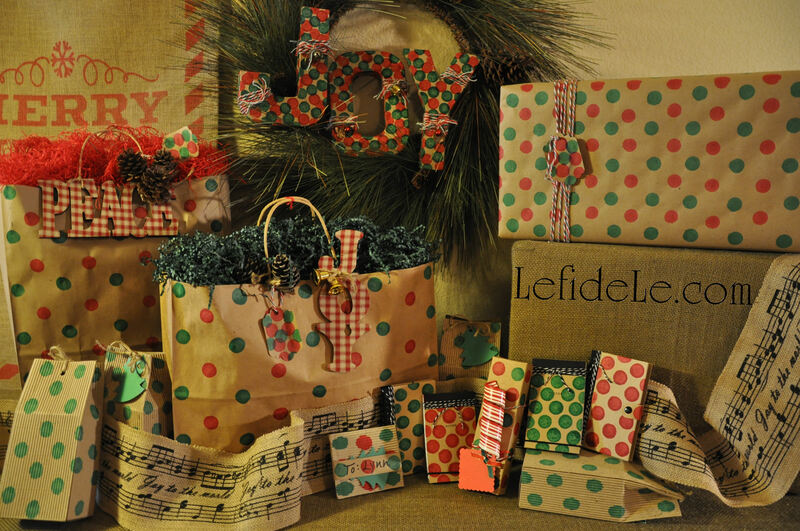 By hand-making your own wrapping, you are not only demonstrating that you really cared enough to go that extra mile, but it’s also beneficial to the environment when others want to continue passing it along. Reusing is even better than recycling! It’s yet another way to give when we are good stewards for His majestic creation.